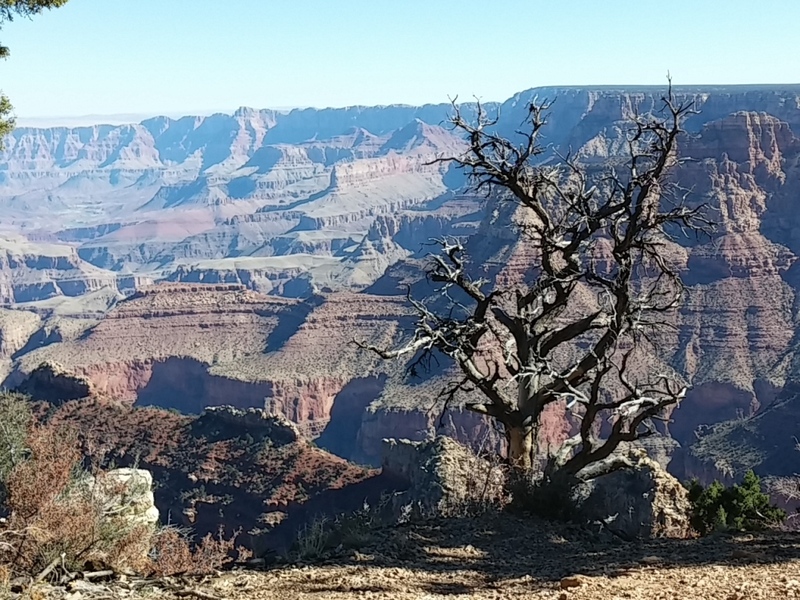 We changed our planned route a bit and snuck over to take a quick peak at the Grand Canyon. 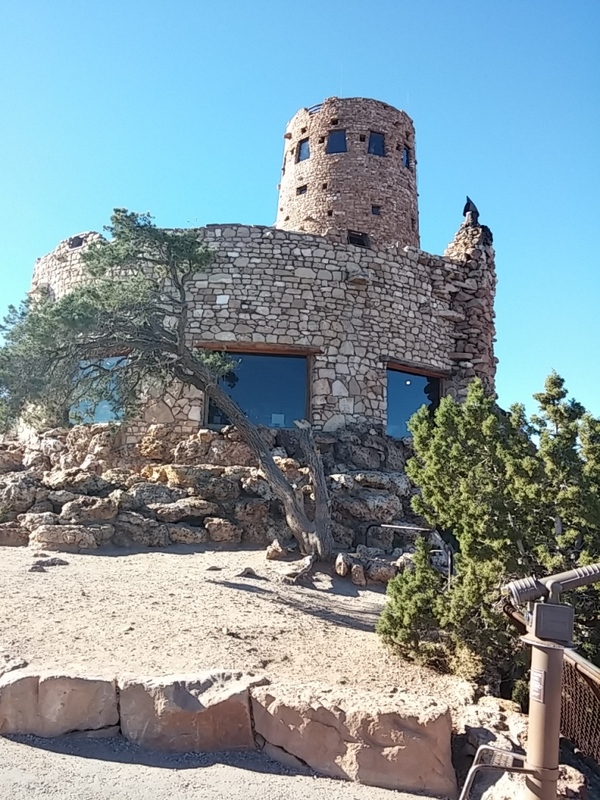 But while the canyon loomed in the background, I fell in love with Mary Colter’s Indian Watchtower at Desert View. Mary Elizabeth Jane Colter was an American designer and architect who designed the 70′ high stone building. 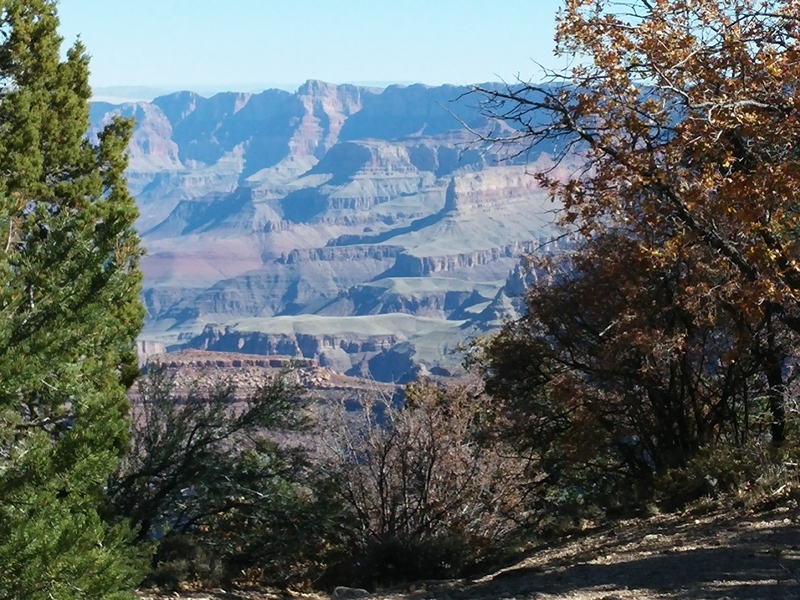 The building site at Desert View is located 20 miles east of the main entrance into the park. 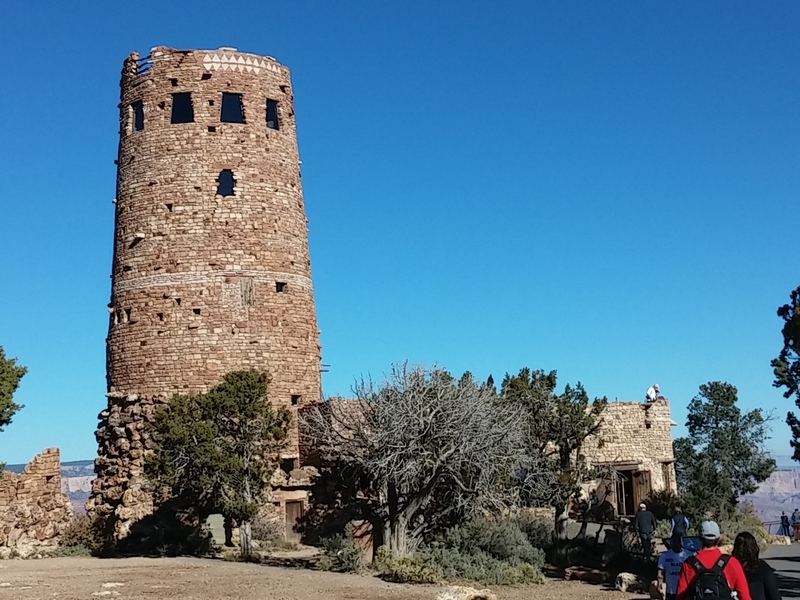 I’m fascinated by the fact that the architect was a woman who was tasked with so many important designs for this national park in the 1920’s and 30’s. The four story structure was completed in 1932. 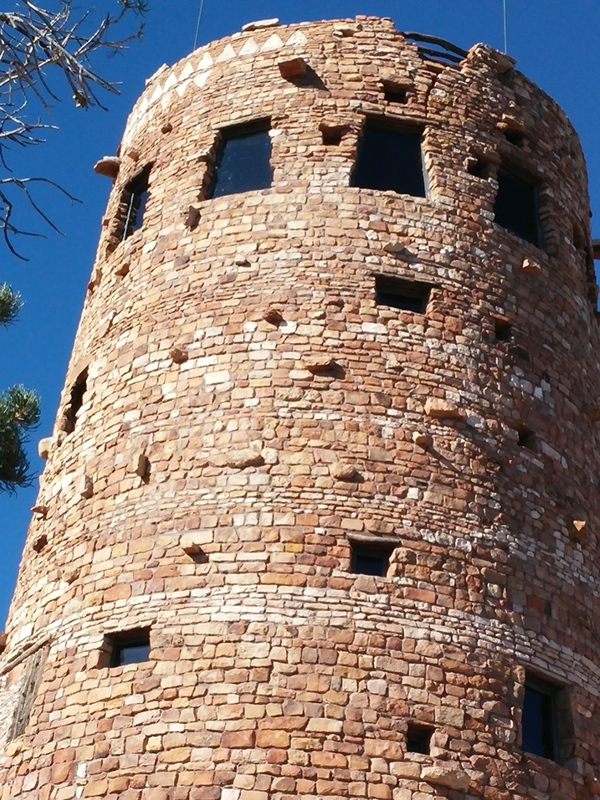 The tower was designed to resemble Pueblo Peoples watchtowers. 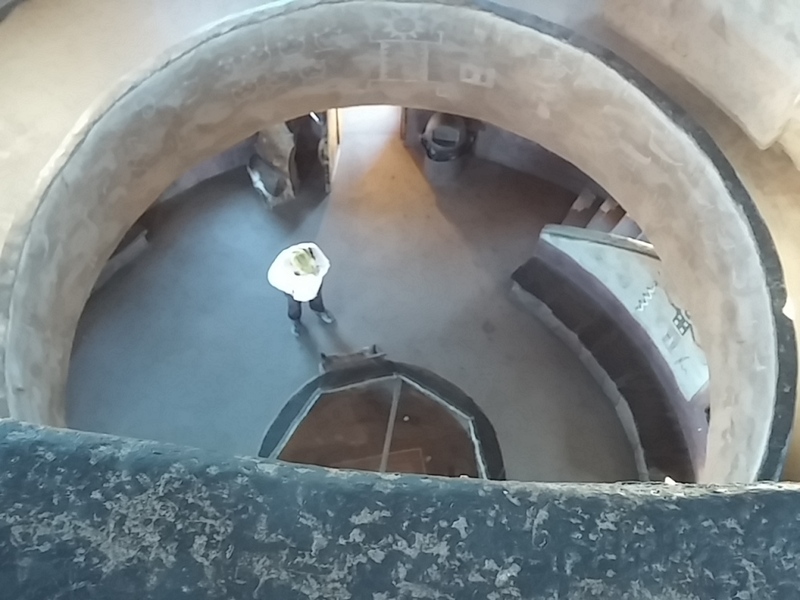 The base is arranged in a large circle and intentionally designed to look as though it is partially ruined. The windows are small, irregularly shaped, and appear randomly placed. Colter spent six months researching before building a scaled model. 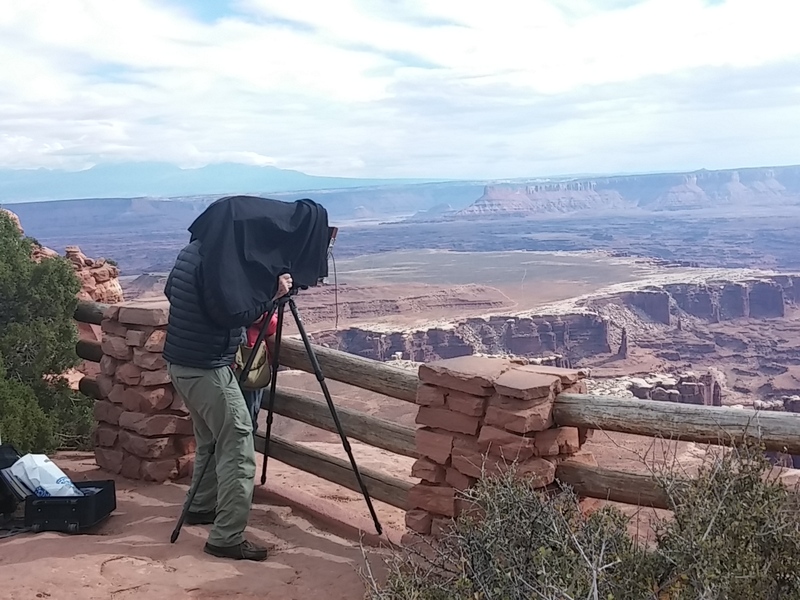 She then had a 70′ platform built to assess the views from the proposed site. I could go on and on, but the photos tell the story better than I do. 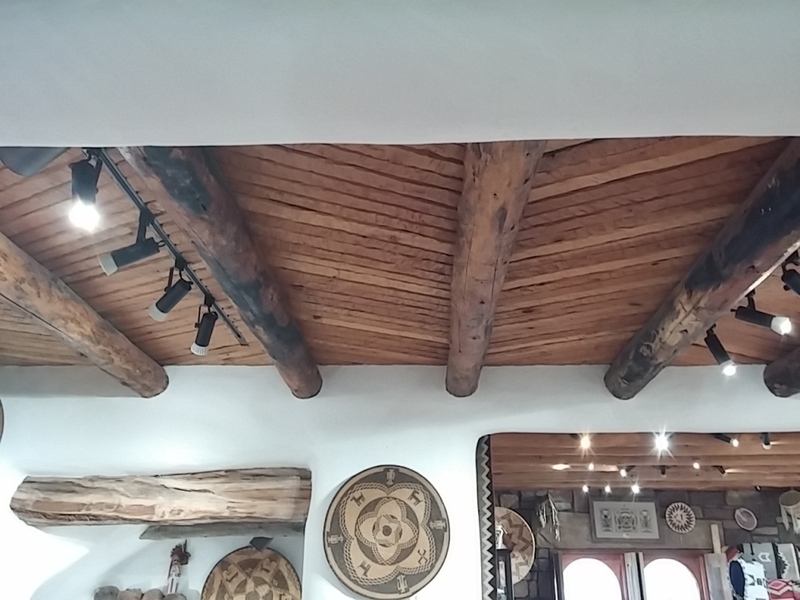 The wood ceiling on the ground floor hides a steel structure that supports the remaining stories. The stairway railings were wrapped with some sort of hide that’s been well worn with decades of use. A view through a central column ties the three upper floors together. 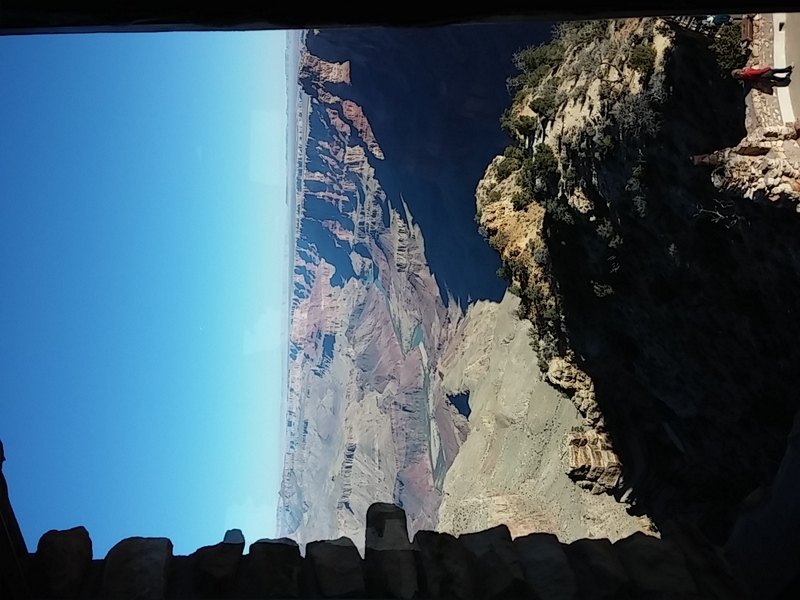 The views from all of the windows are stunning. 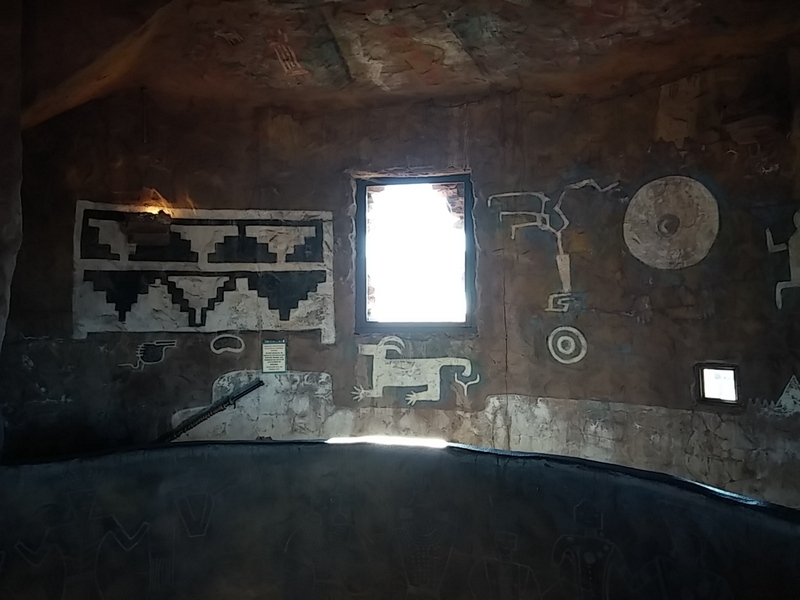 The artwork and design touches on both inside and outside of the building show an intense use of detail as shown in this closeup of the top floor ceiling and the petroglyphs embedded on a rock within a T-shaped door formation on the tower wall. 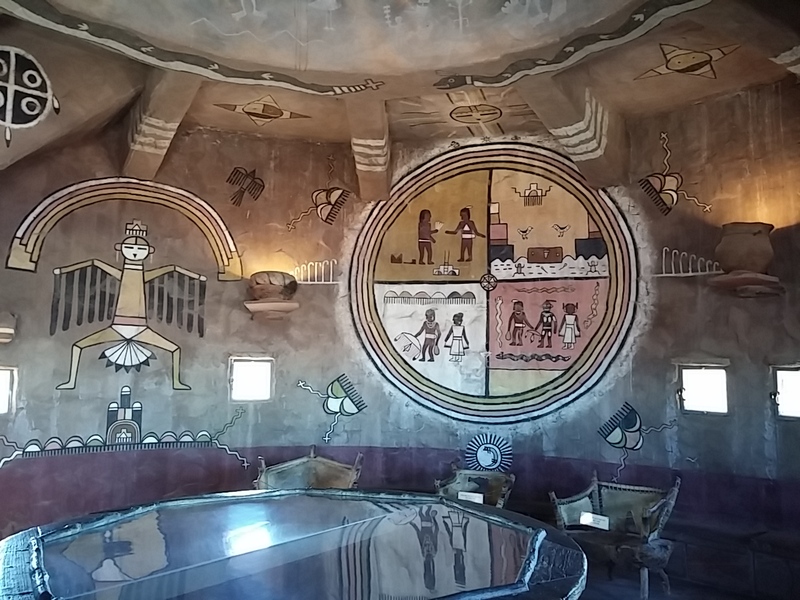 The murals inside use colors that many of the area tribes user in their artwork. See the jagged brick around this window? 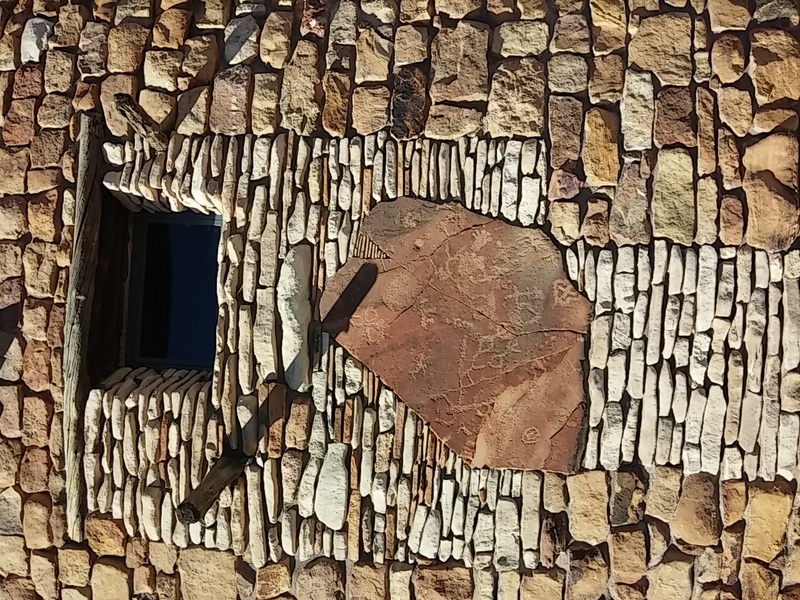 From the outside of the tower, this looks like a hole in the brick so that the wall is broken. 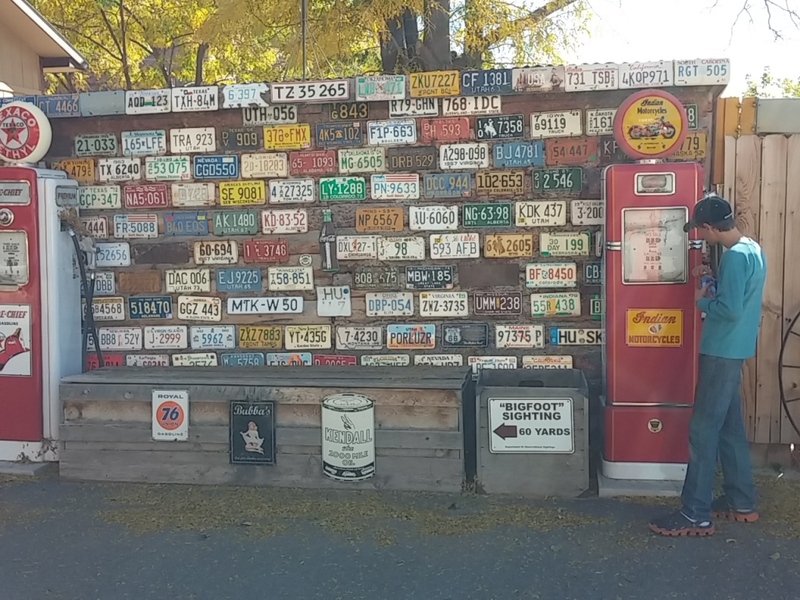 We happened upon a historic trading post on our way to the Grand Canyon. 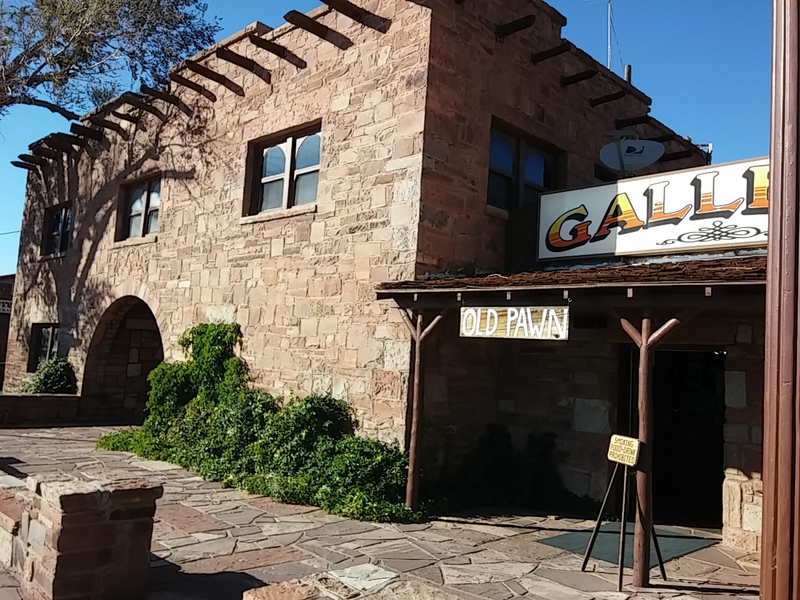 The Cameron Trading Post was established in the early 1900’s. These sterling silver bridles had the most amazing mouth pieces I have ever seen in a bit. 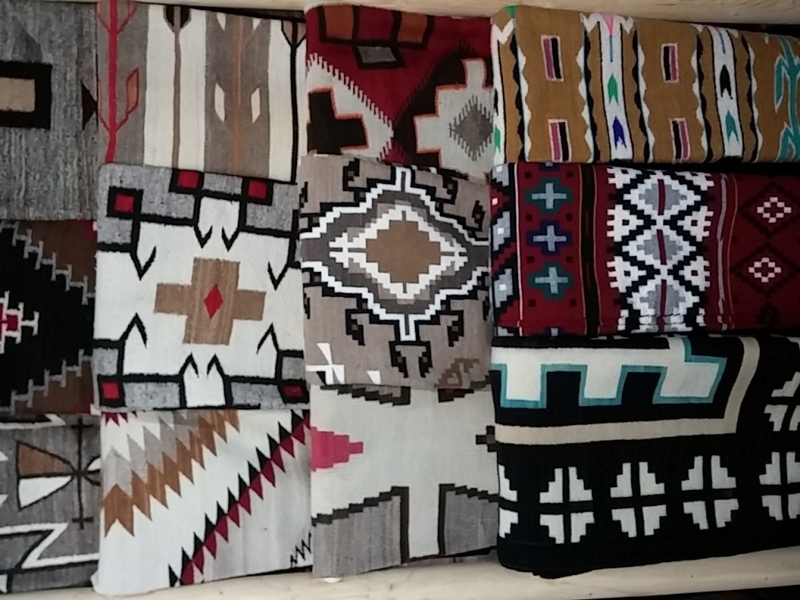 Beautiful Native American weaving in beautiful earth and sky colors. There were many architectural design worth copying. 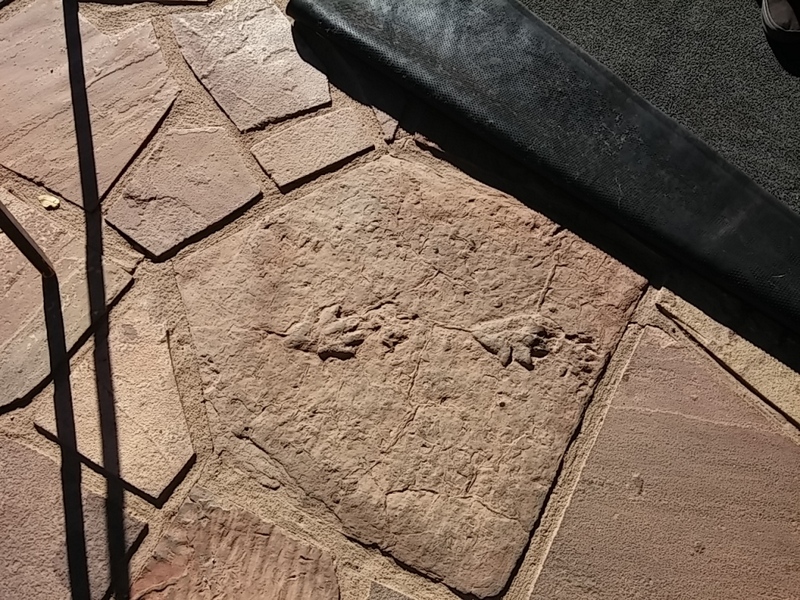 There are even some casts of dinosaur tracks. The young man working called in extra help to let Rich and I tour the upstairs area. I think the building was over 90 years old and just beautiful. 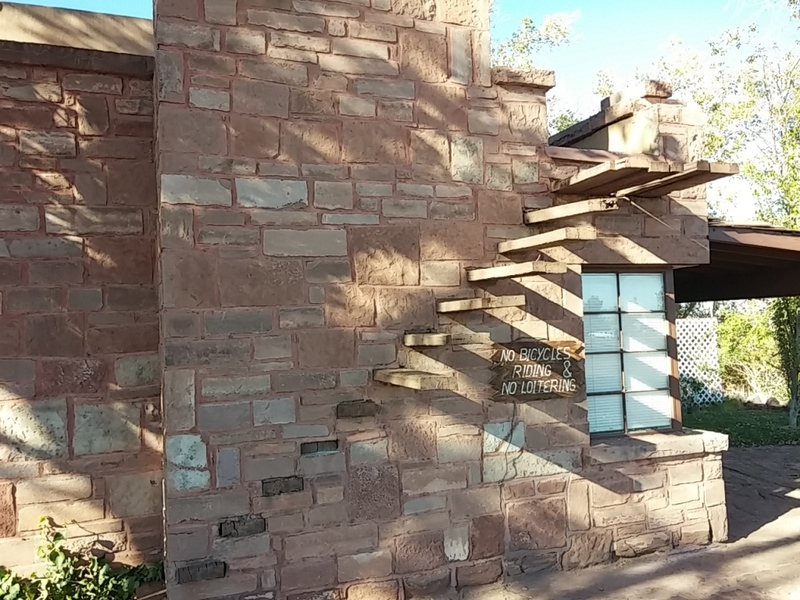 These outside stairs led up to an upstairs patio. The store was beautifully arranged and displayed. And the young man tending the store was full of stories about ghosts and items moved in the middle of the night. 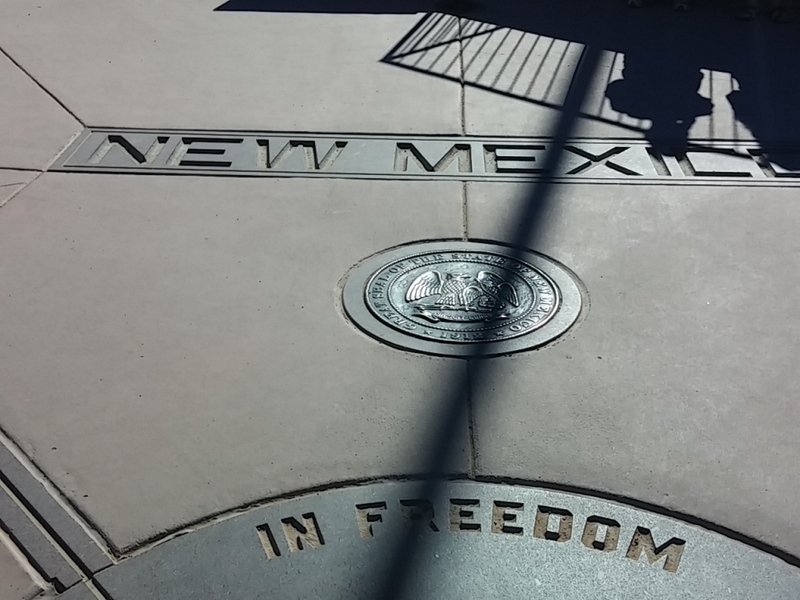 On our drive from Cortez down to Cameron, we decided to stop at the Four Corners Monument. Four Corner was more of a tourist trap than an informative site. 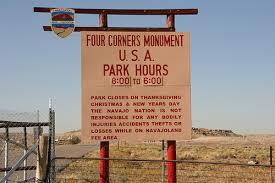 Clue #1: It is called Four Corners Monument not Four Corners National Monument. 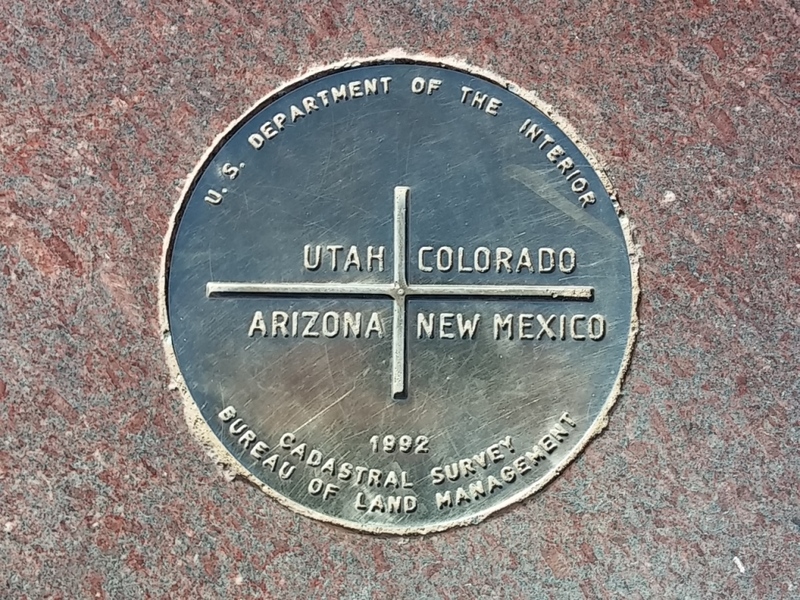 Clue #2: The sign into the monument was not the typical Park Service government brown. 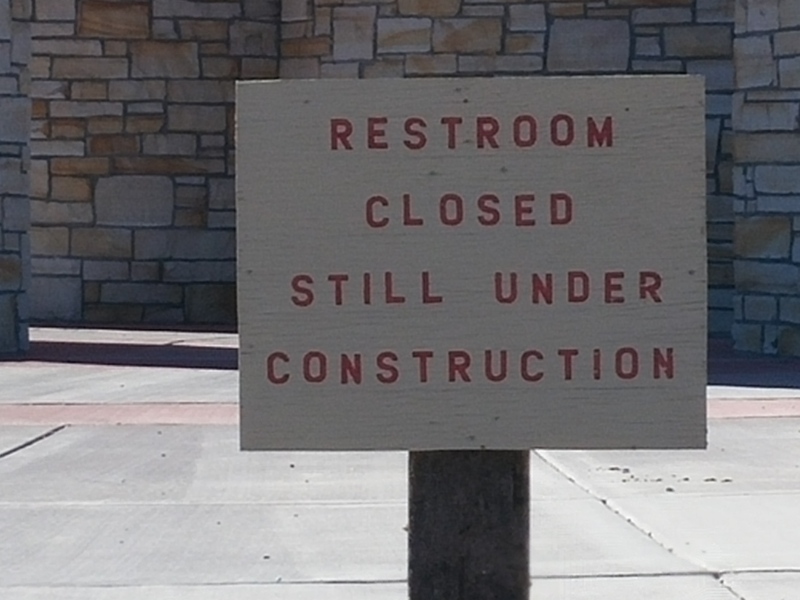 Clue #3: The restrooms were very nice, but they were closed as noted with a sign that looked like it had weathered at least a year. Visitors needed to use Sani Huts. 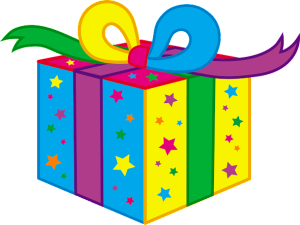 Clue #4: There were multiple vendors set up to sell their beautiful wares and they had their personal pickups backed up to their stalls. 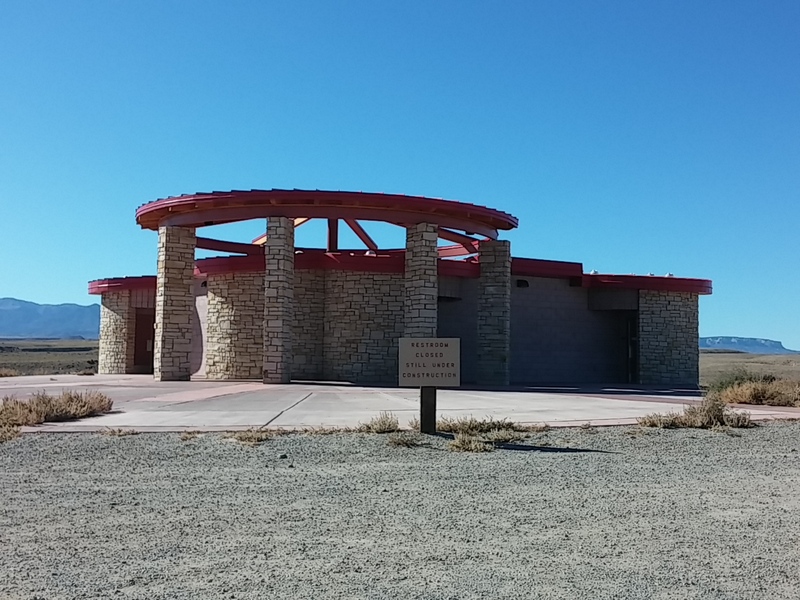 Turns out the monument is run by the Navajo Nation as a tourist attraction in conjunction with the Ute Mountain Ute Reservation. 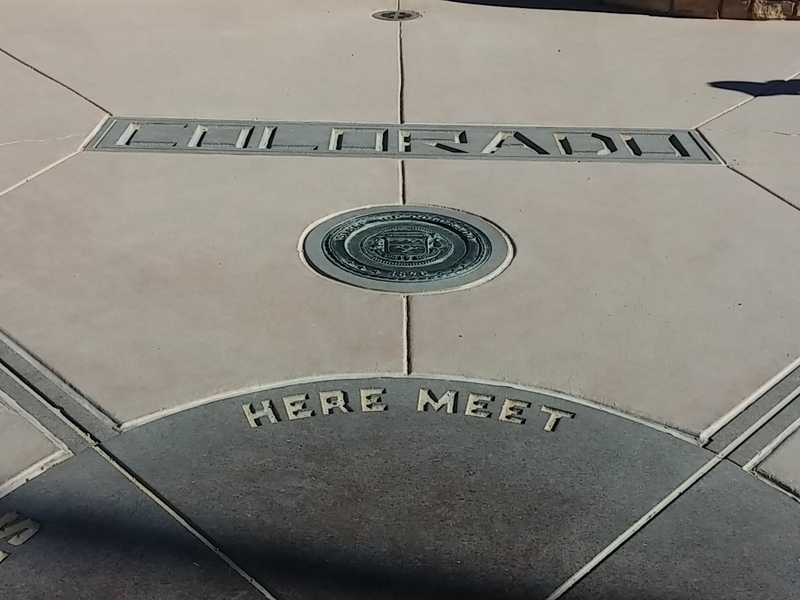 The monument itself is stunning and a tad bit informative. 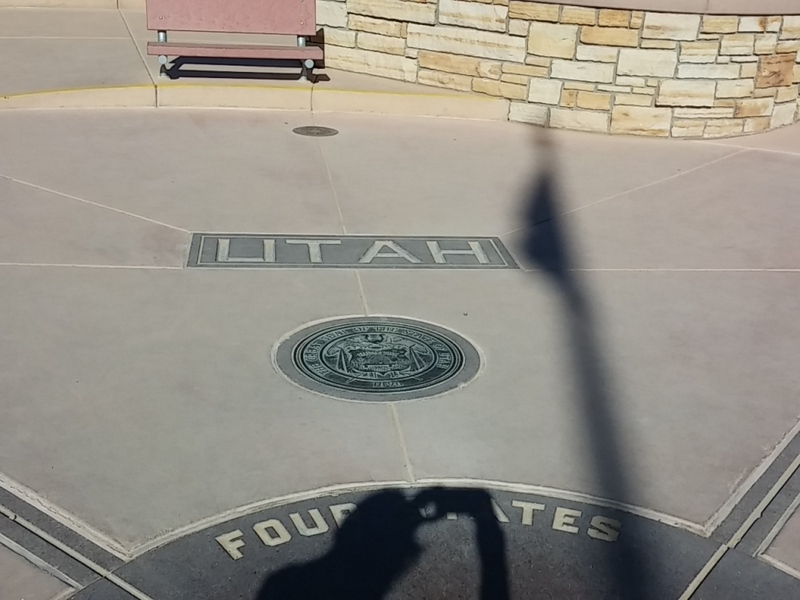 It was amazing to stand with my feet strategically placed so that I was within four states at once. 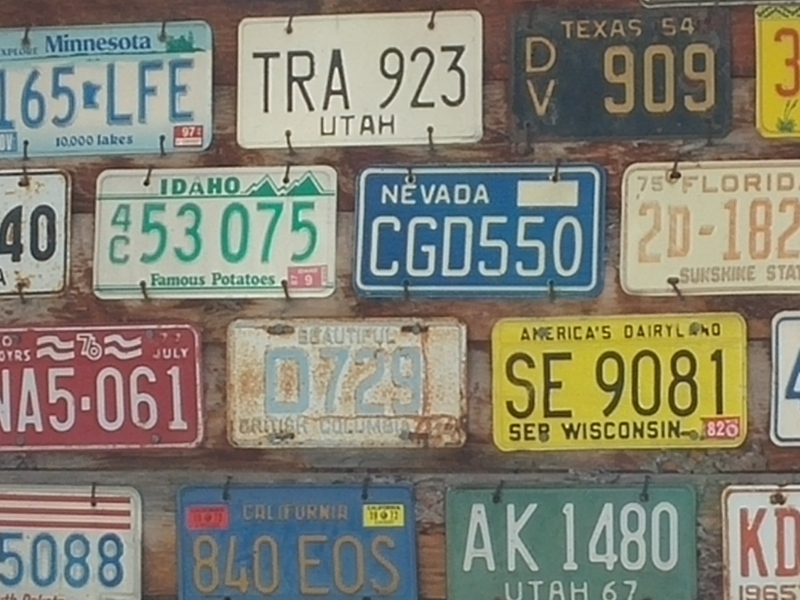 I’m very glad we stopped, but from now on I will do a bit of research before driving out of our way to stop at a place I don’t know anything about. 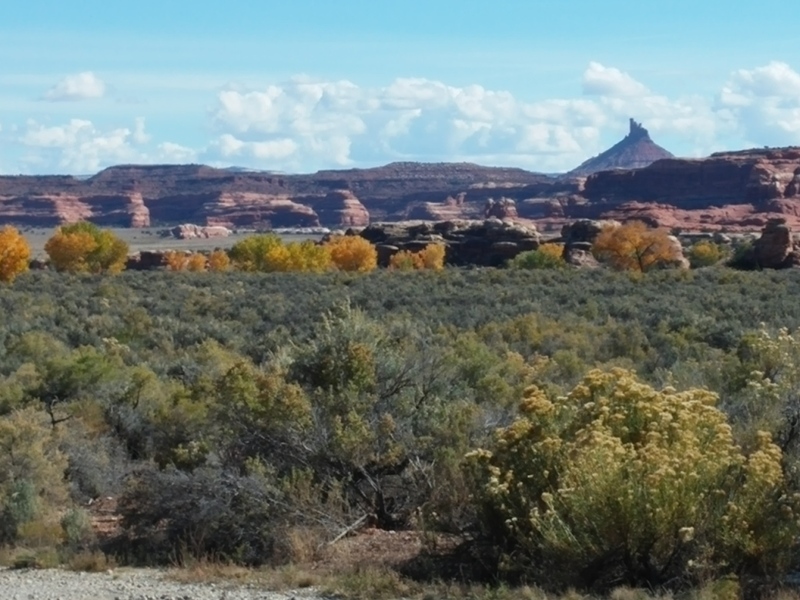 Cortez is the closest bigger town (one with grocery stores, fuel, etc…) to the Four Corners area, and it’s also the closest town to Mesa Verde National Park. 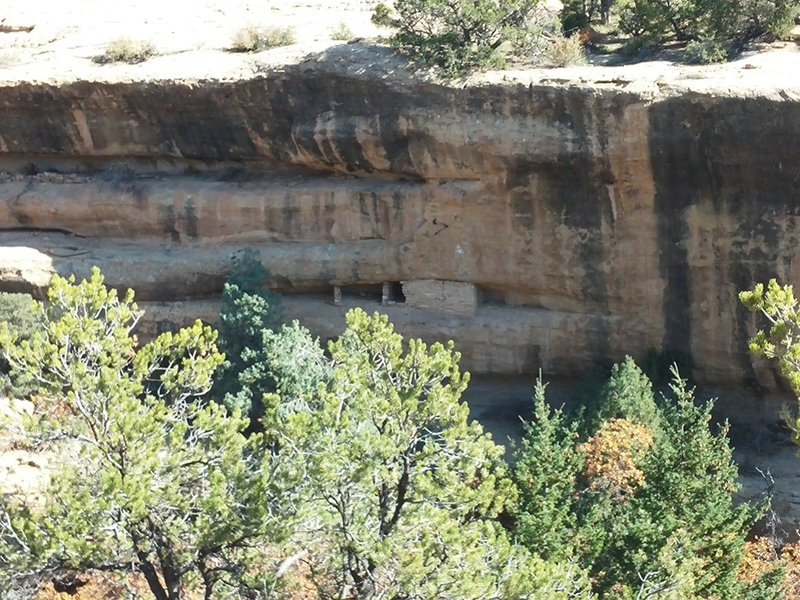 Mesa Verde is home to more than 600 cliff dwellings. 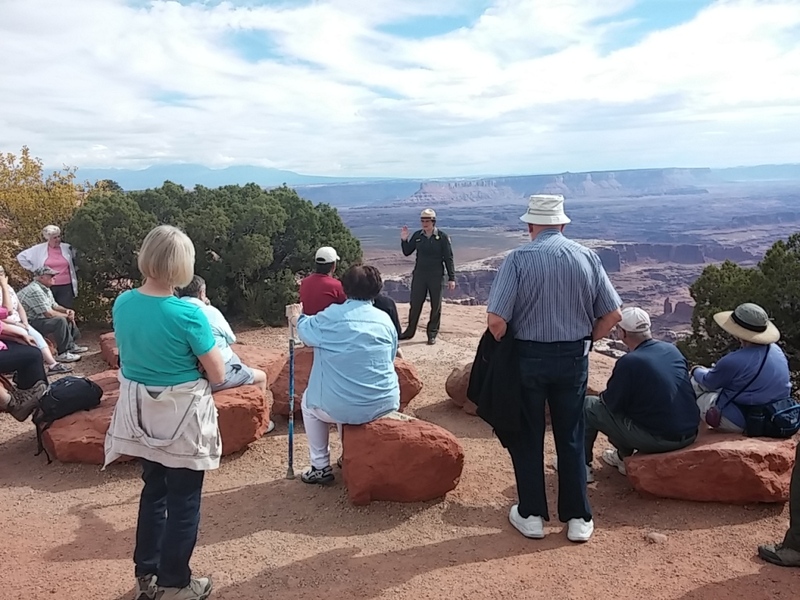 During the summer season, visitors can tour several of them with guides. Only one or two were offered for guided tours during our visit. 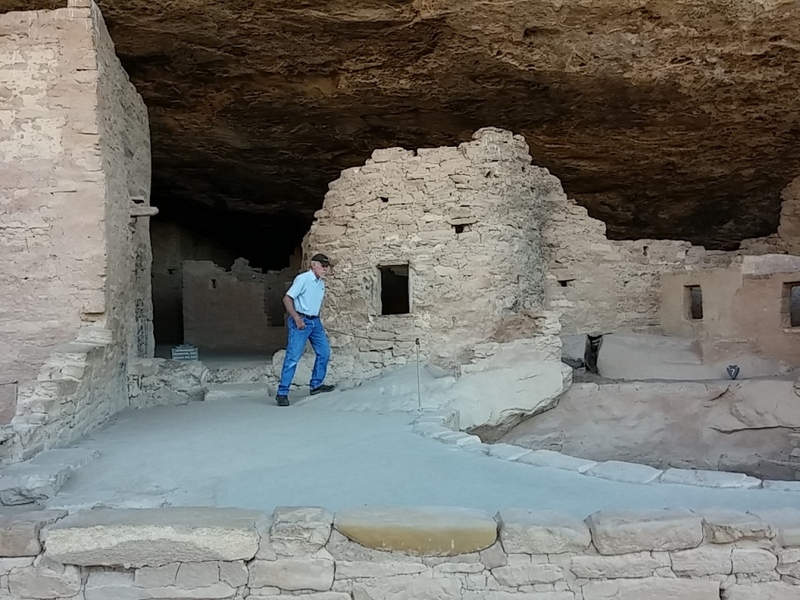 We opted to tour Spruce Tree House on our own. 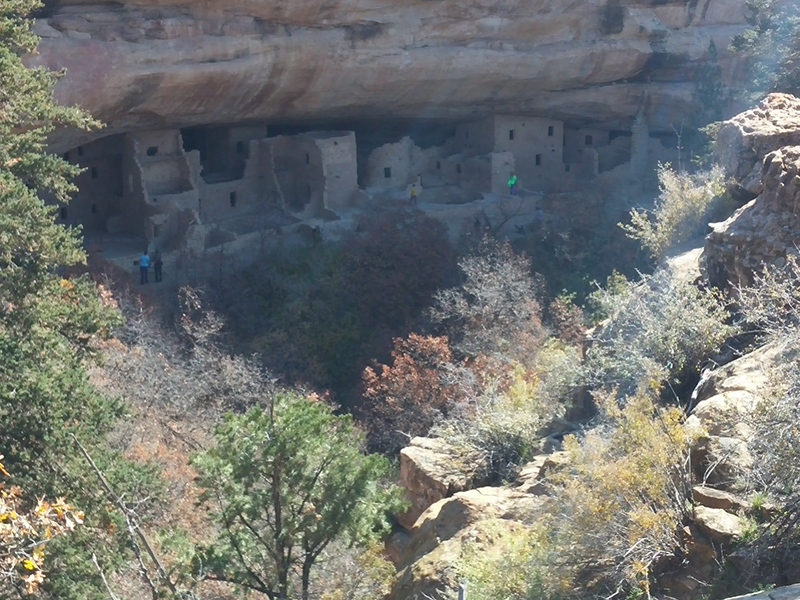 It is the third largest and best preserved cliff dwelling in the park. 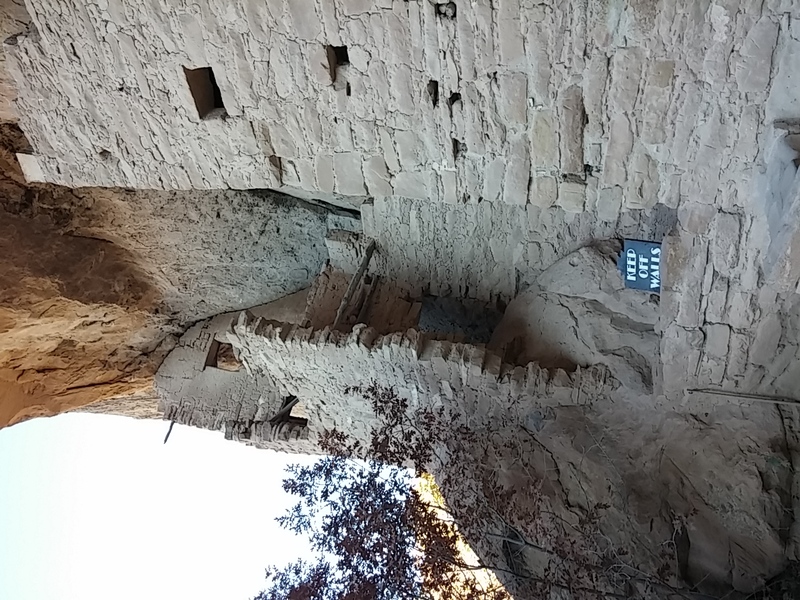 We hiked down to the dwelling on a steep paved path. As we walked down the path, we noticed small sections of bricked areas. In the middle of this picture you’ll see a wall of rocks just above the tree line. These were storage areas for grains and other supplies. 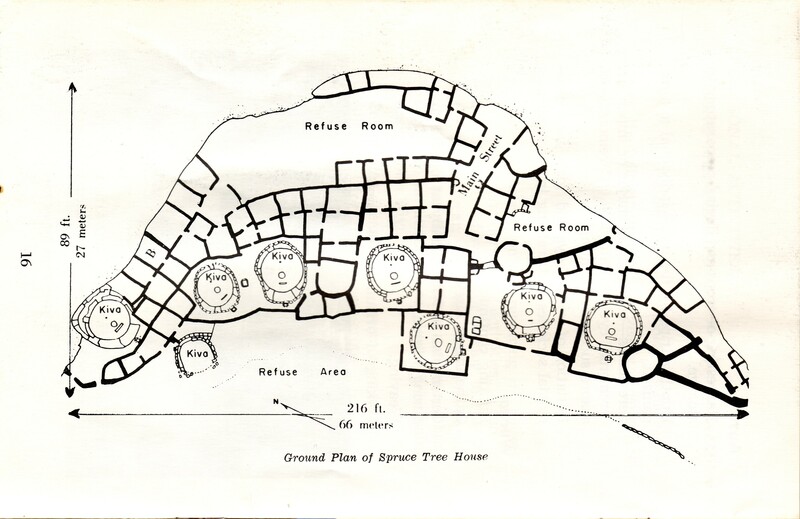 Here’s a diagram of the entire dwelling which housed 60-90 people–about 19 households. The dwelling was two stories tall in most places, and three stories in others. What looked like windows to us are actually doors. See the ledge around large round area in the picture below with the logs sticking up? 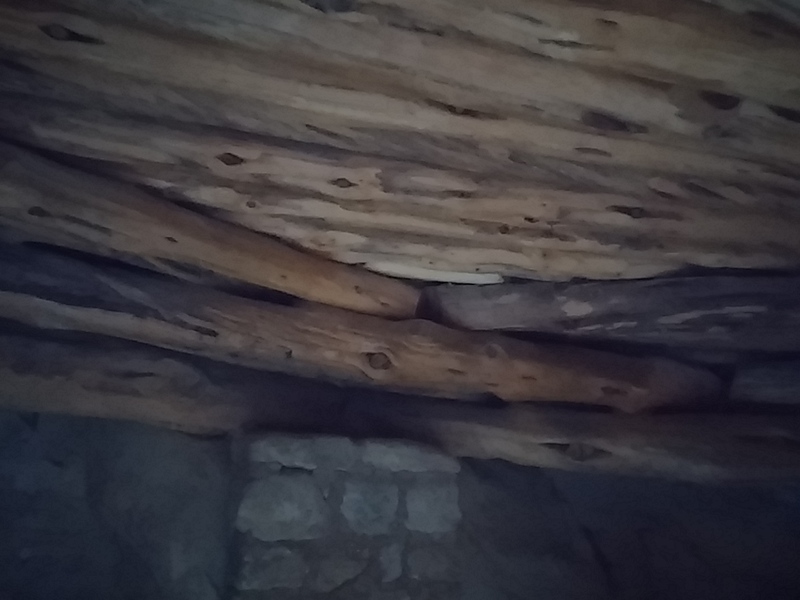 That’s the top of a kiva, a room used for religious rituals. 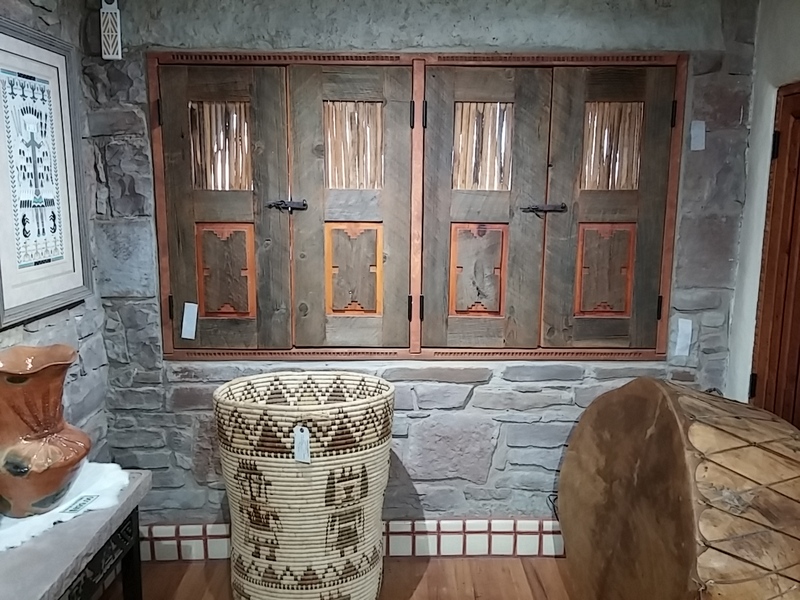 All kivas are built virtually the same with six upright pillars, a firepit with a stone deflector and ventilation system, benches, and small openings for storage. 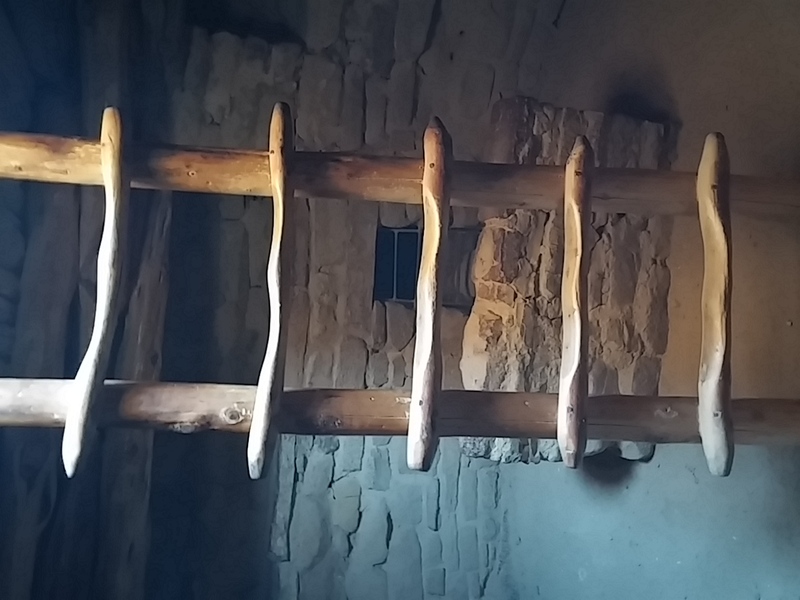 Visitors to the Spruce Tree House can climb down a ladder and sit in a reconstructed kiva. 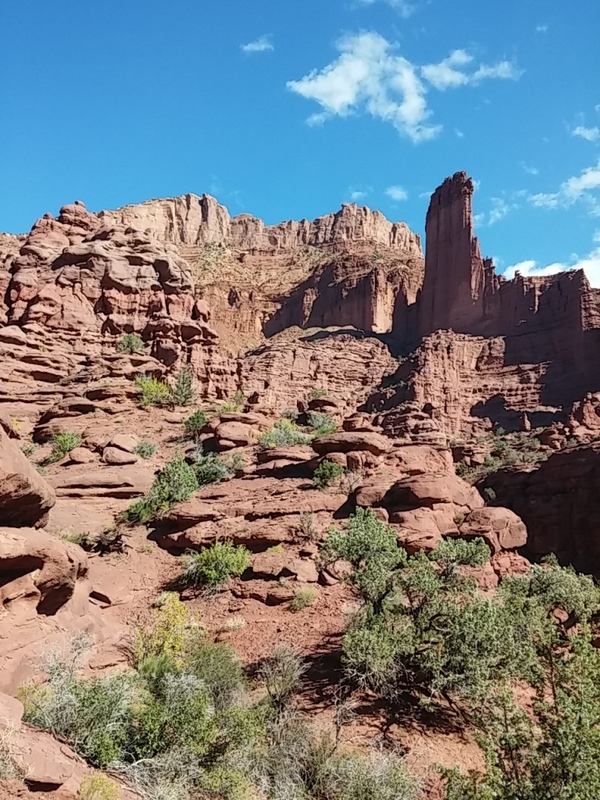 We climbed down and took a few pictures. 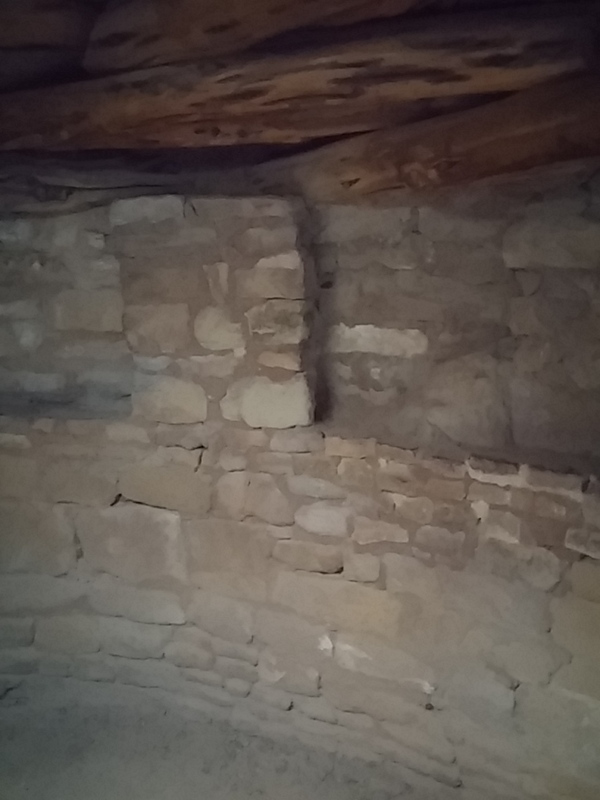 This shows one of the six pillars spaced evenly around the kiva walls. 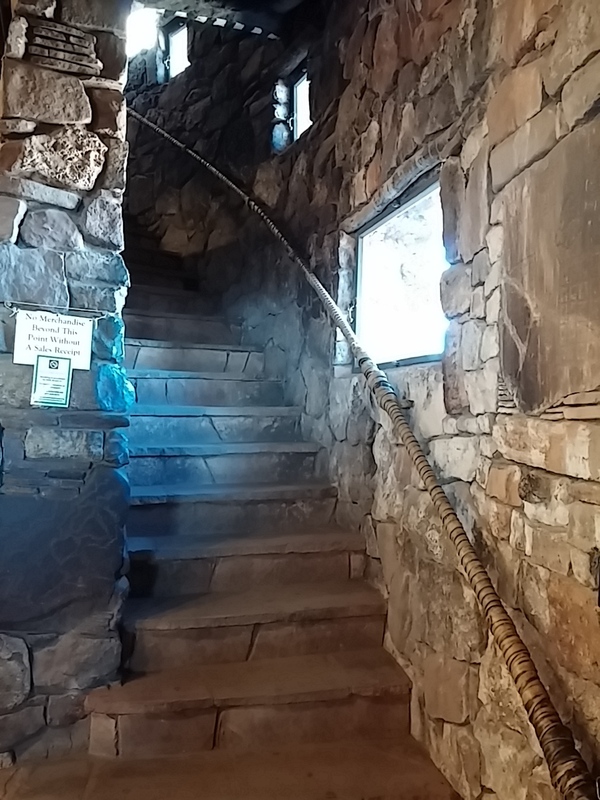 Here’s a picture of the ladder (well worn by thousands of park visitors) with the fire ventilation system in the background. 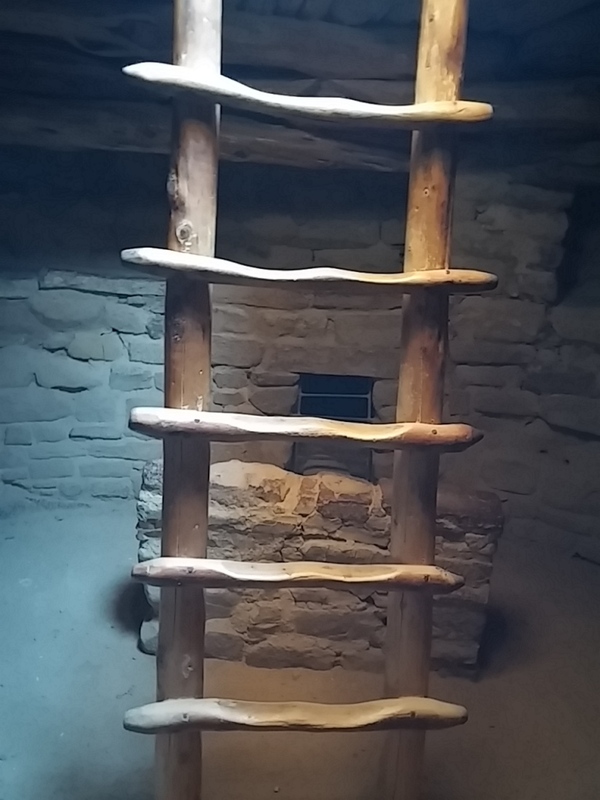 The system draws outside air and causes the smoke to rise out through the ladder opening. 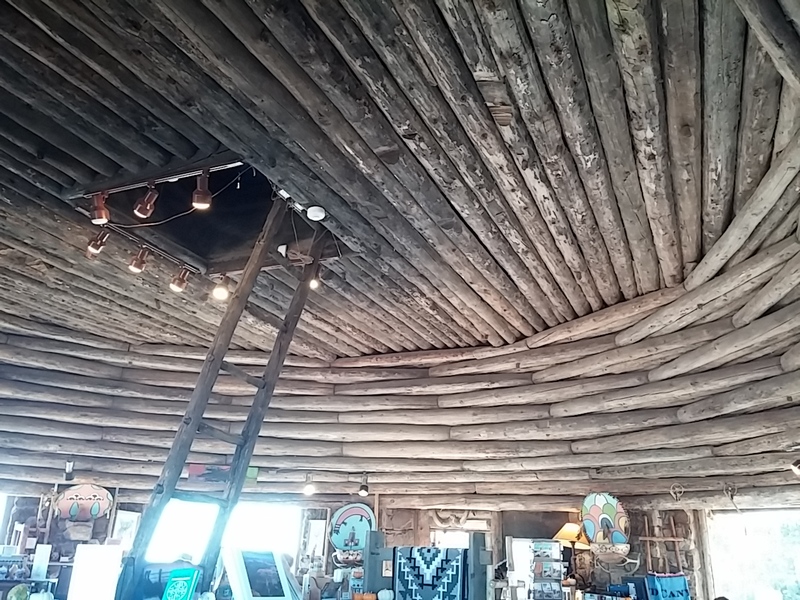 This is a picture of the kiva roof. 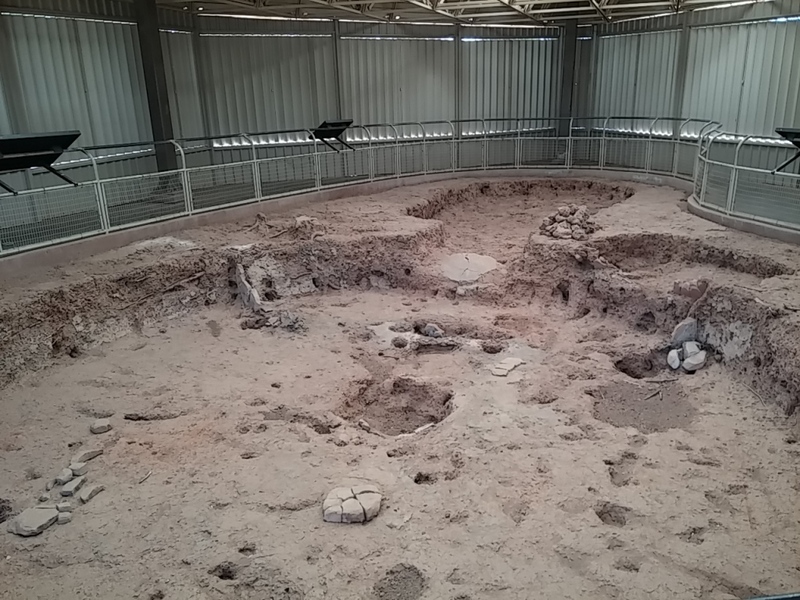 It was reconstructed based on archaeologists’ findings of existing kivas. 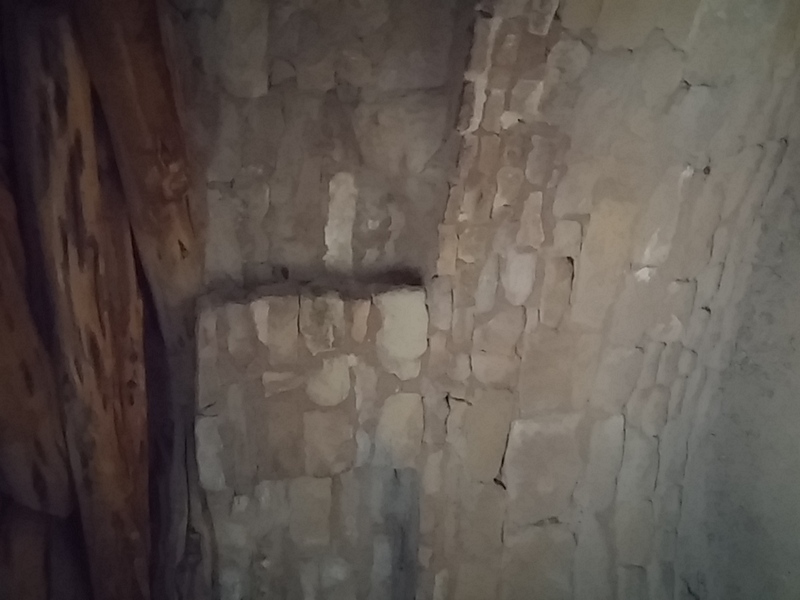 While the roof in this kiva was reconstructed with new wood, the wood shown in the picture below is original. 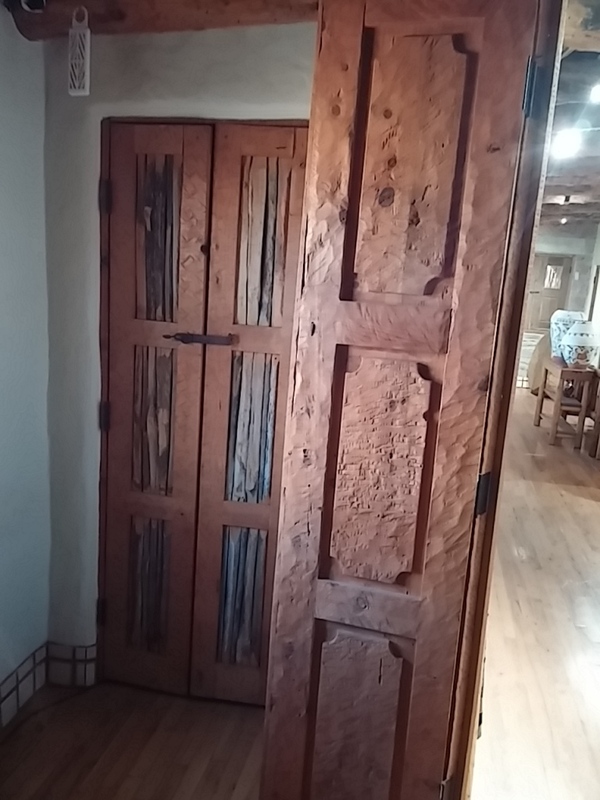 Amazing considering that the dwelling was used between 1200 and 1280 A.D. 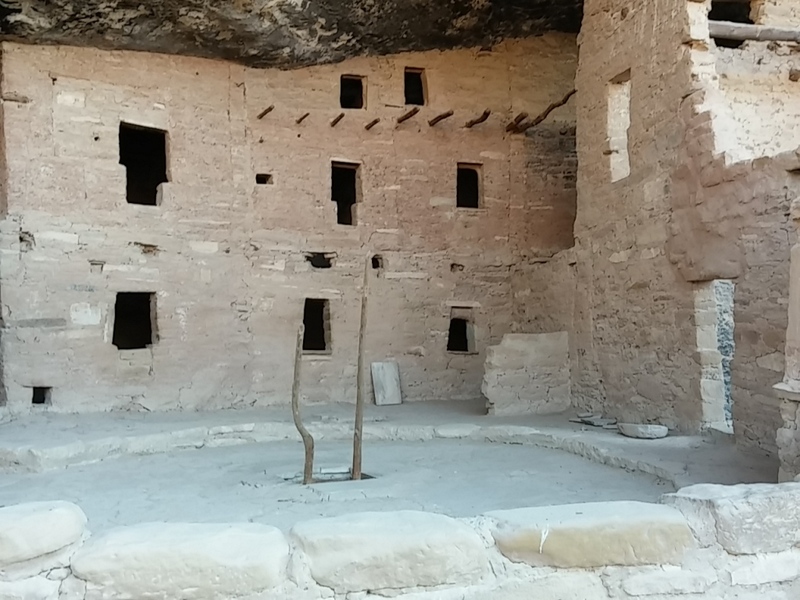 There were other dwellings in the park. 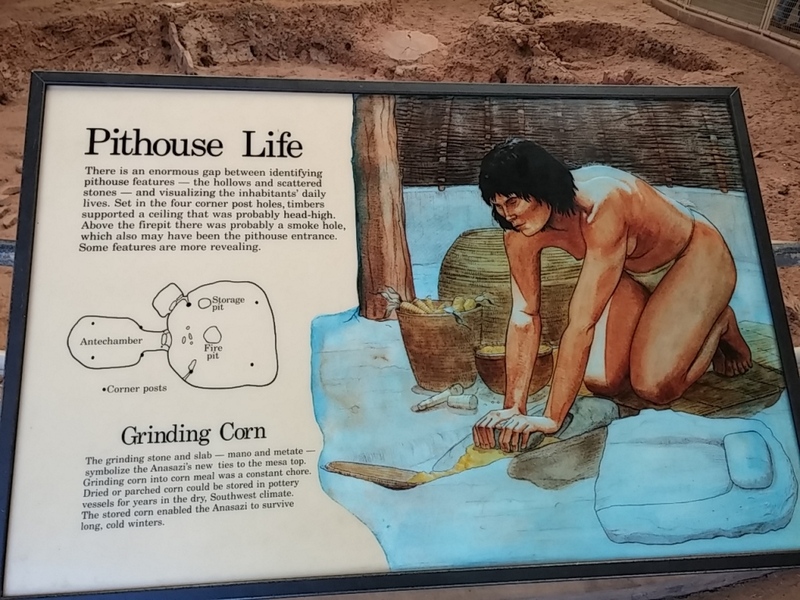 The one below shows a pithouse which was dug into the ground and covered with a roof and walls. These predated the cliff houses. 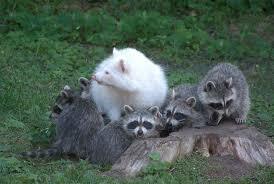 Back to the Spruce Tree House. Here’s a picture of Rich standing next to a door so you can see how short the door is. I asked a guide about the natives’ height thinking that maybe the people were very short. 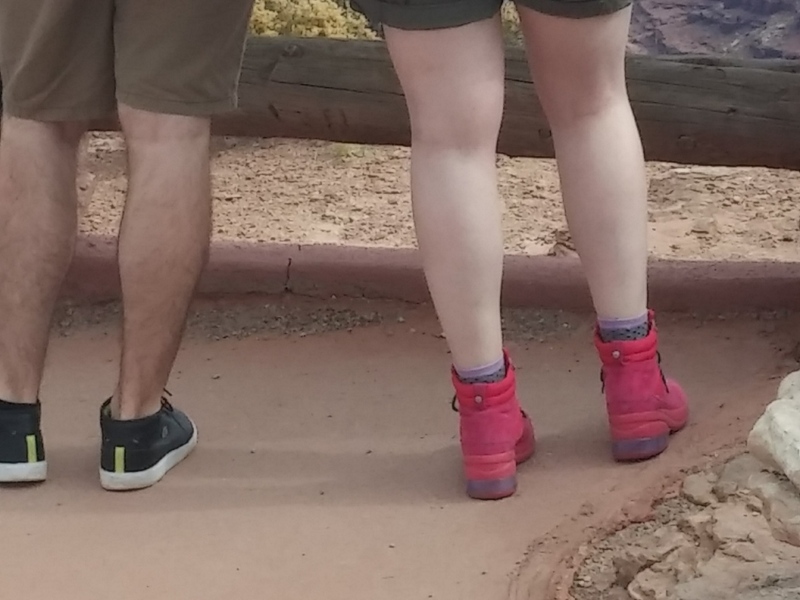 I was wrong… She said that the men were about 5’6″ and the women about 5′. 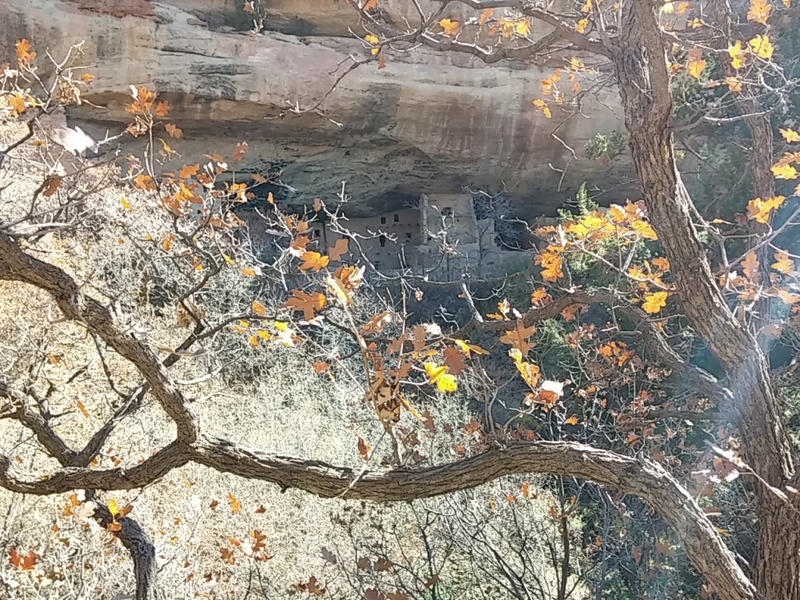 A view of the house from the hike down to it. 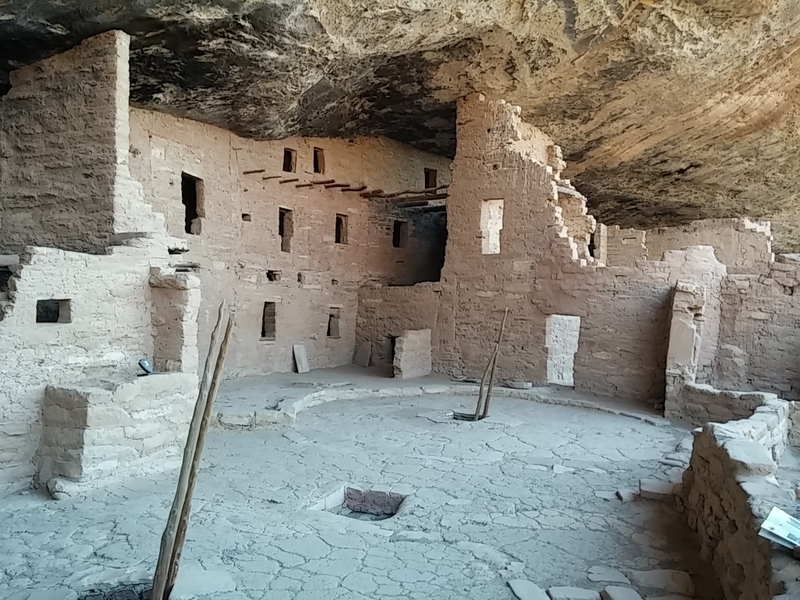 The natives farmed the ground above the dwelling to raise their crops of corn, beans, and squash. 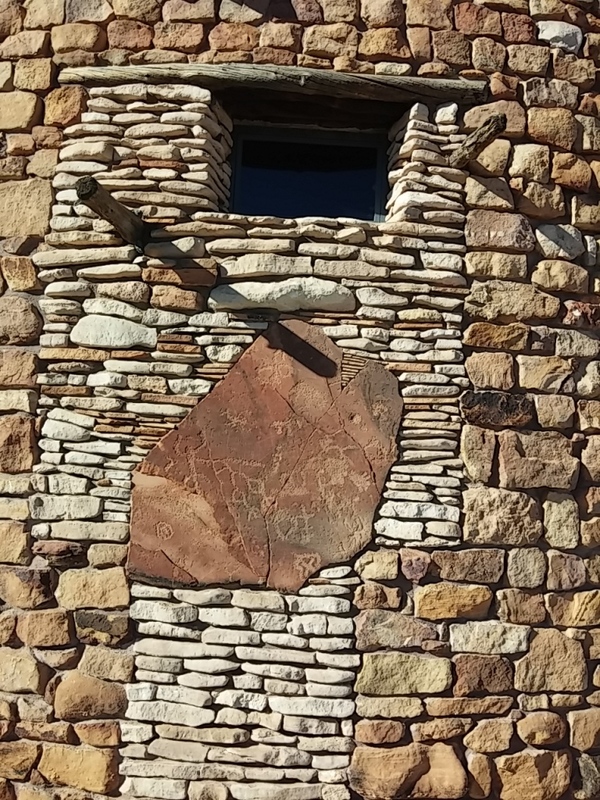 A cross section of the end of the house showing the utilization of rock and brick. 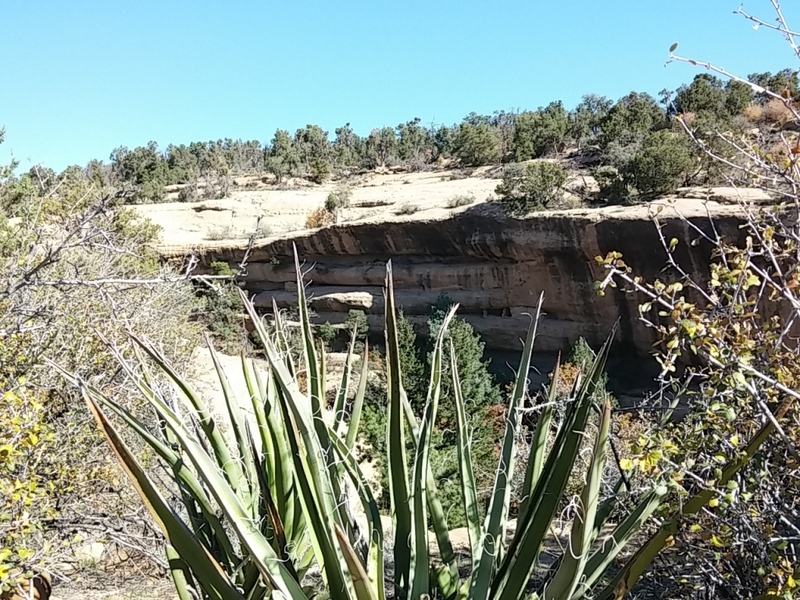 Mesa Verde was an amazing park to visit! One day in Moab last week, we stopped by a very unique place called Hole N” the Rock. 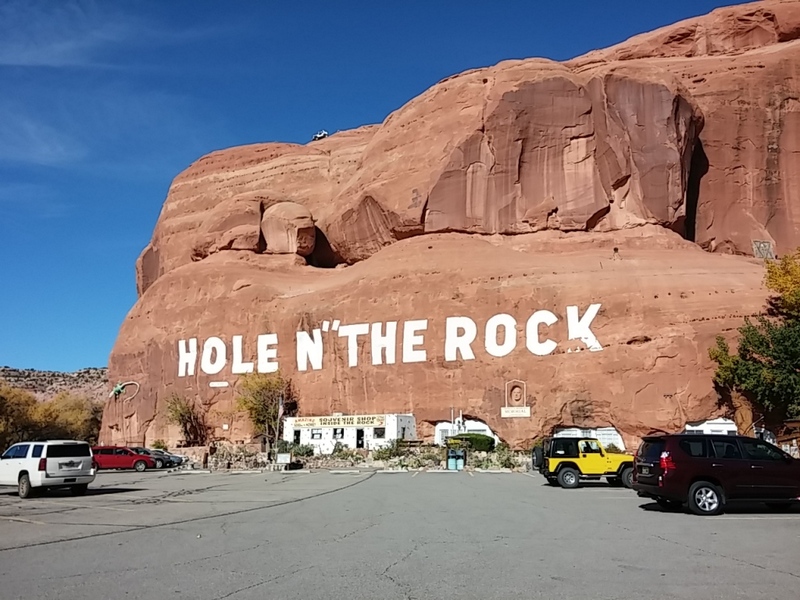 Visit Hole N” The Rock, a most unique home, carved out of a huge rock in Utah’s Canyonlands Country. 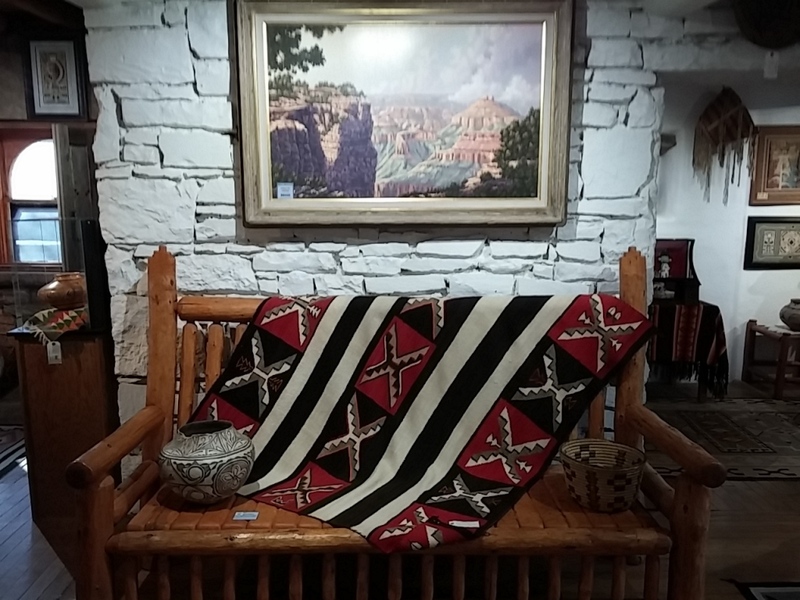 This historic 5,000 square foot home and unusual gift shop and trading post are open all year. Take a guided tour of the home and appreciate the rich history within its walls. 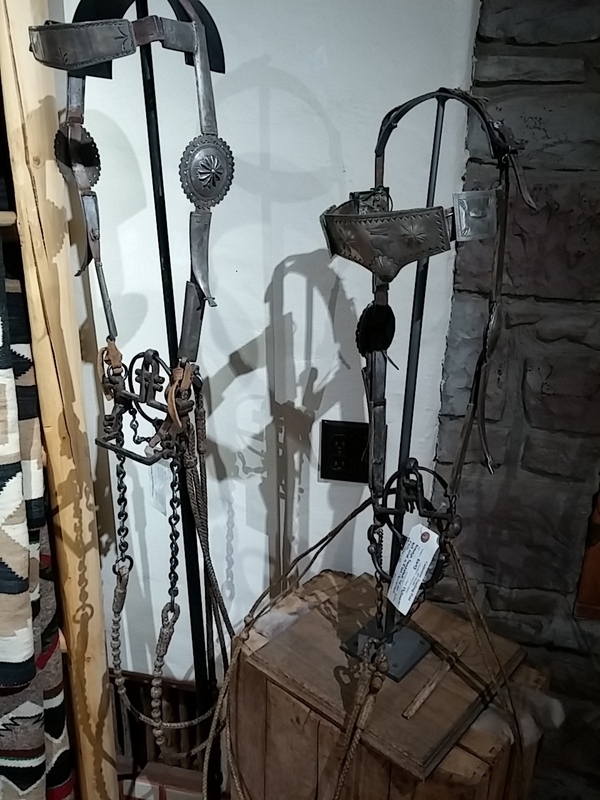 While we didn’t tour the Hole N” the Rock House, we did marvel at the metal and art work. 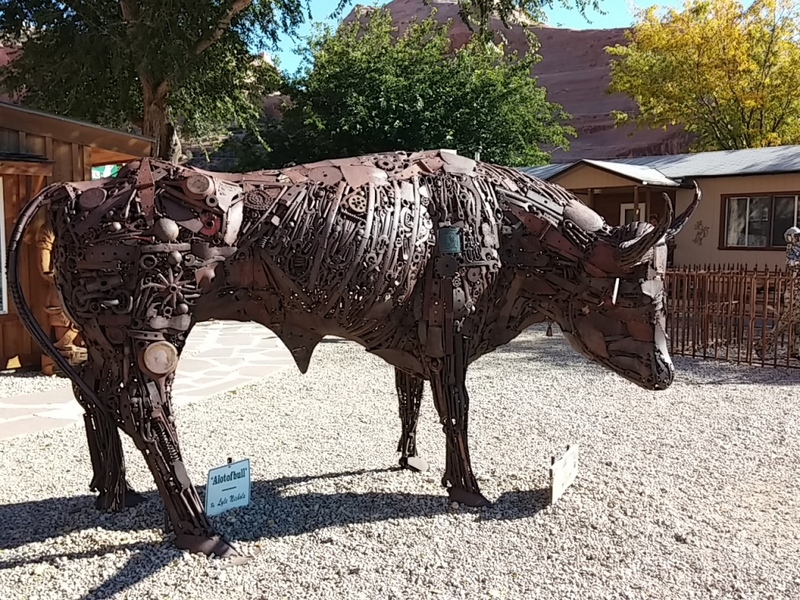 I’ve seen several metal sculptures like this, but none have the tightness of design that this bull does. Amazing! 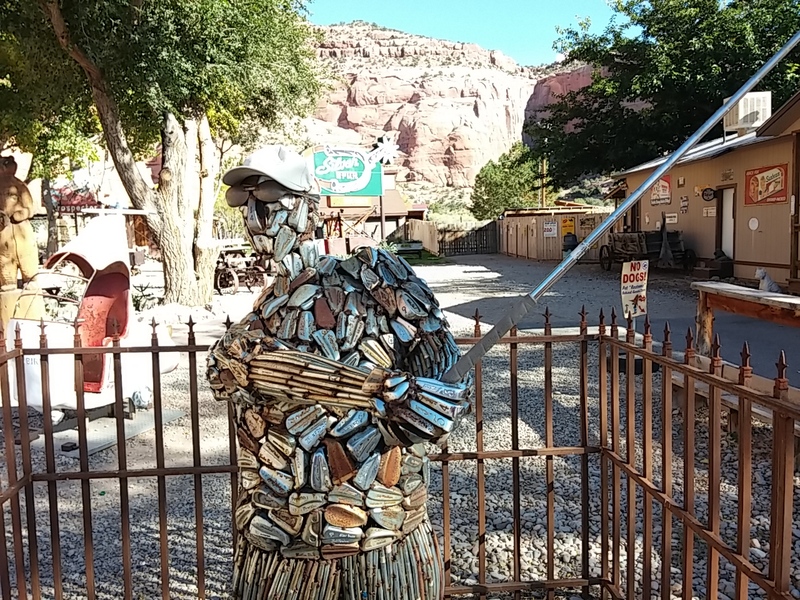 This golfer is made completely of golf club parts. 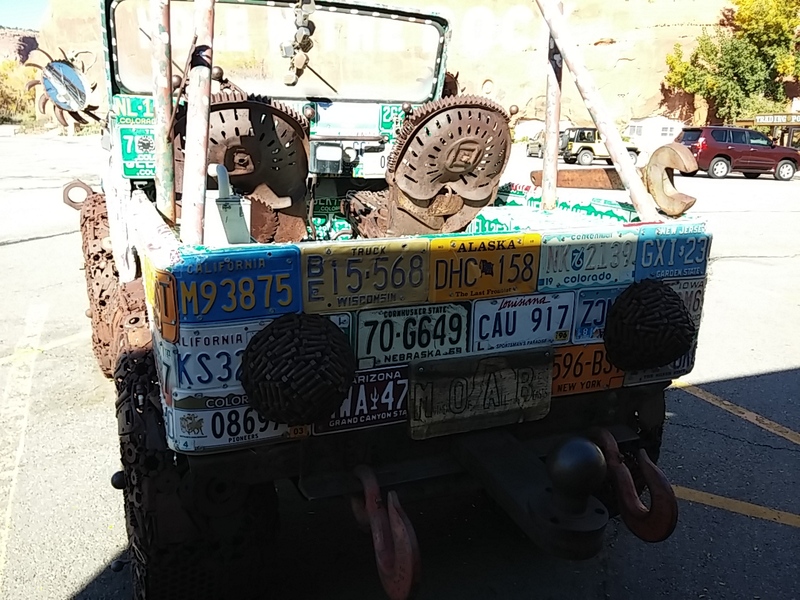 Then we came across the most amazing Jeep we have ever seen! Ever! 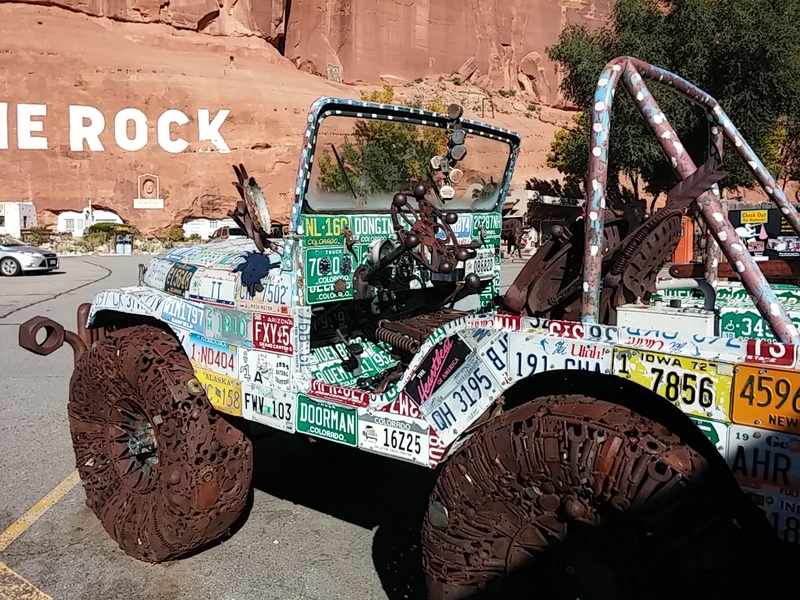 It’s a Jeep body that’s been covered with dozens of license plates from all over the country. All other components are made of recycled metal. 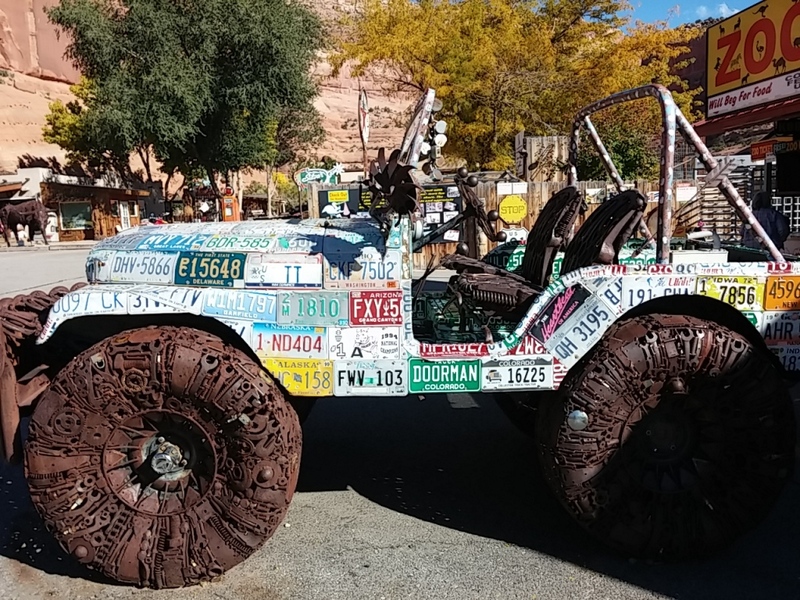 Take a look at those tires! All four are the same size and design. 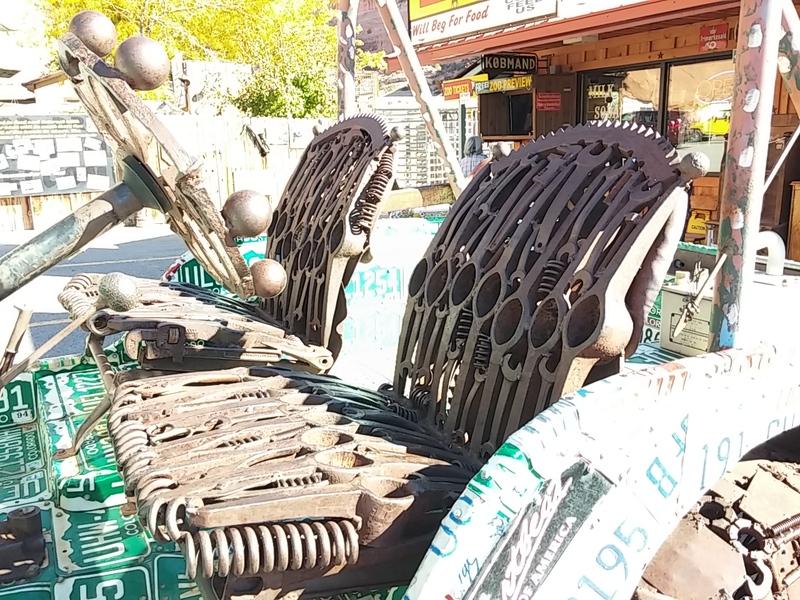 While the seats aren’t comfortable–made with pick axes, springs, and wrenches–they are a sight to behold. The steering wheel is made of horseshoes and ???? A better view of the Jeep’s insides. 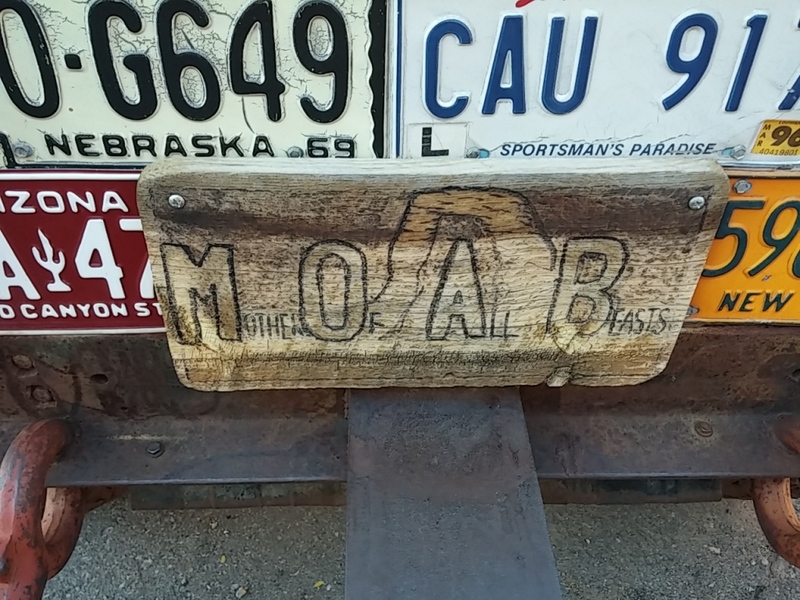 And, of course, it has its own hand-made license plate: Mother Of All Beasts. The rear lights look like beehives, appropriate for the Beehive State. We went to the last Cortez Farmers Market of the year yesterday. I had one purchase in mind: Locally grown Anasazi (anna-saw-zee) Beans. I ended up buying 10 pounds from a local vendor who was selling beans from Adobe Milling, a local company that mills dozens of local bean varieties among other products. 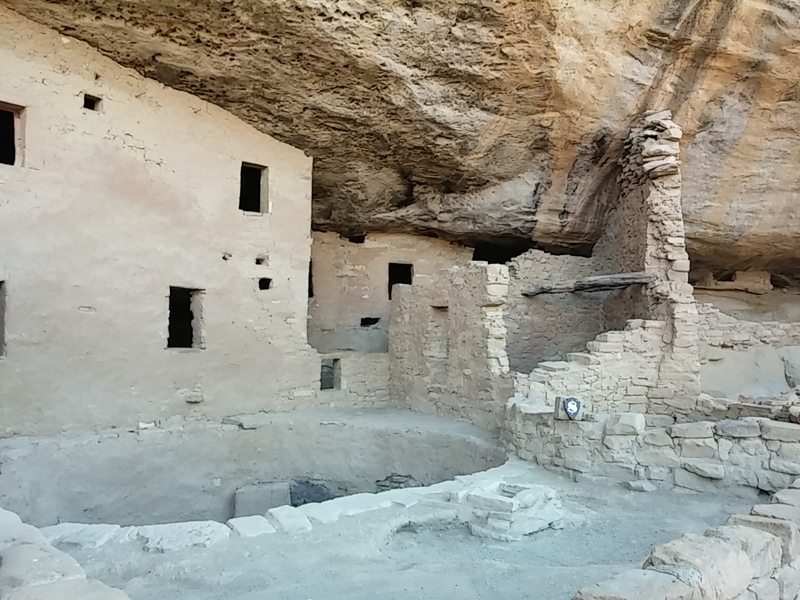 The Anasazi were Indians who lived in the four corners area (now Colorado, Utah, Arizona and New Mexico) dating back to 130 A.D. 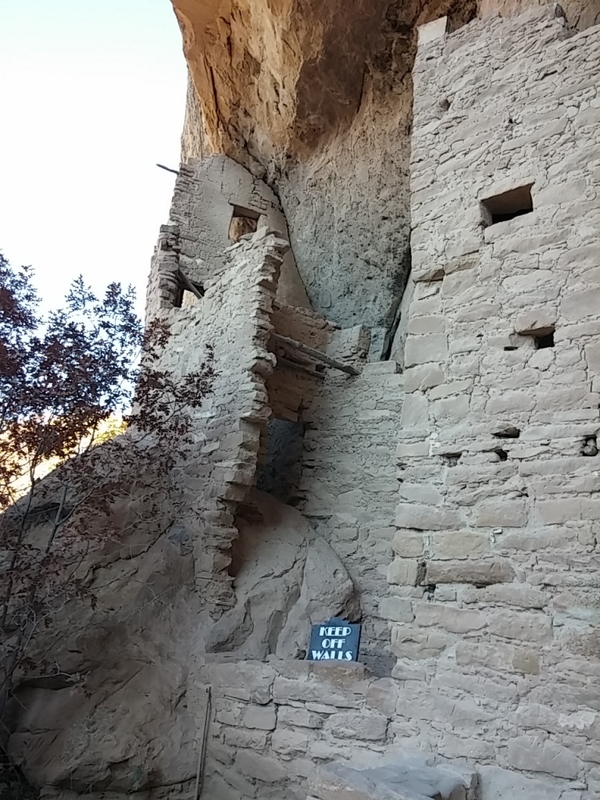 The are best identified with their substantial architectural achievements known today as “cliff dwellings”. 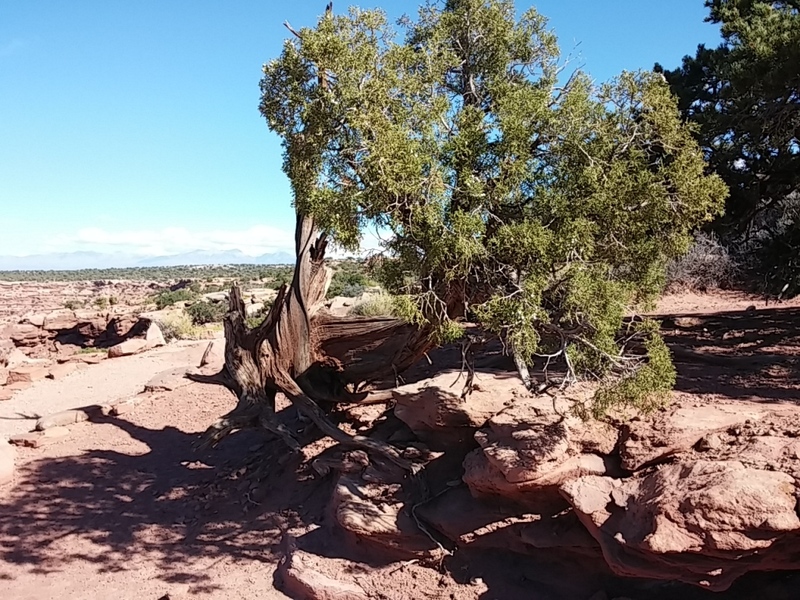 “Anasazi” is a Navajo word perhaps best translated as “the ancient ones”. 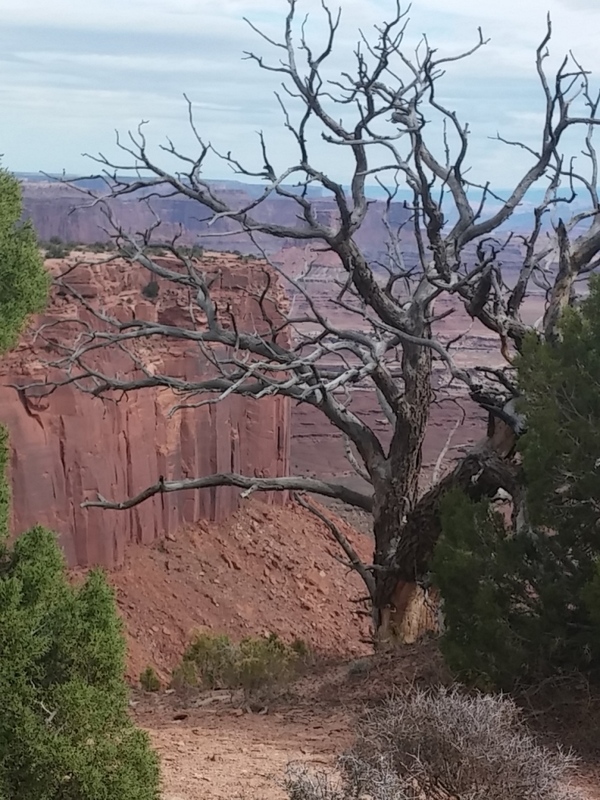 Anasazi Beans were one of the few crops cultivated by the Anasazi. 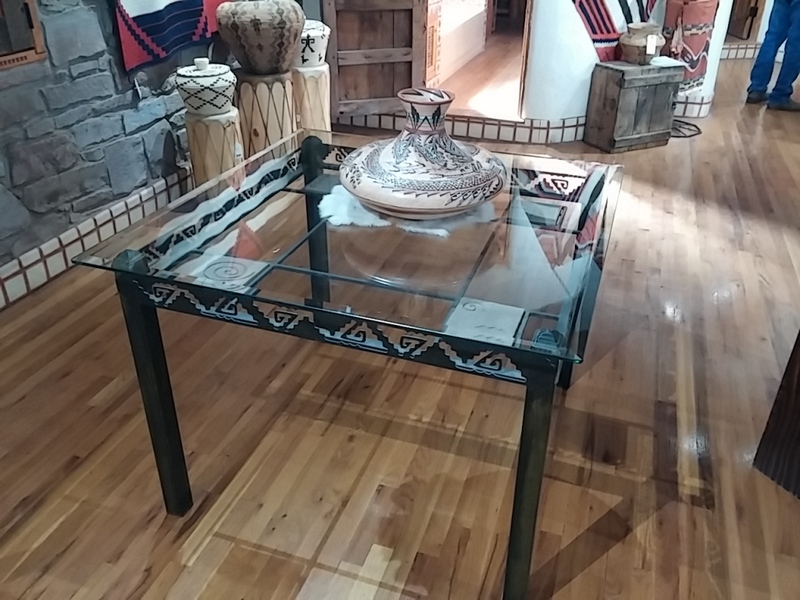 They were found in the ruins by settlers to the four corners area in the early 1900’s. 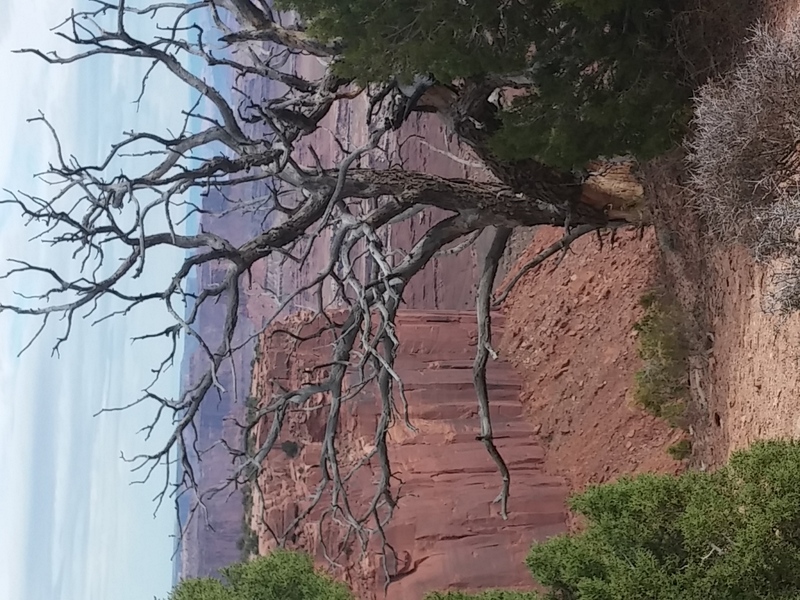 Presently they are grown at 7,000 ft. elevation on the same land the Anasazi inhabited. Anasazi Beans are considered an unusually tasty baking bean, very scrumptious with ham and flavorful in Mexican dishes. This sweeter and mealier bean will allow many culinary delights! 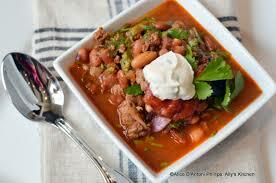 They also contain 75% less of the gas-causing carbohydrates compared to pinto beans! I’ve had the beans only once before. Ivy, the woman who brought them to a pot luck, raved about how they are they best beans ever. Ivy’s casserole dish was mighty tasty, so I agreed with her assessment. When Ivy was traveling through the Four Corners area, she bought a 50 pound bag of the beans. That’s how good they are. While the uncooked beans have stunning burgundy and cream-color speckles, once they are cooked they turn a solid pink color. If you come across some, buy them and give them a try. You’ll love them! Down your pants and in your boot! First stop on the way was at Newspaper Rock. 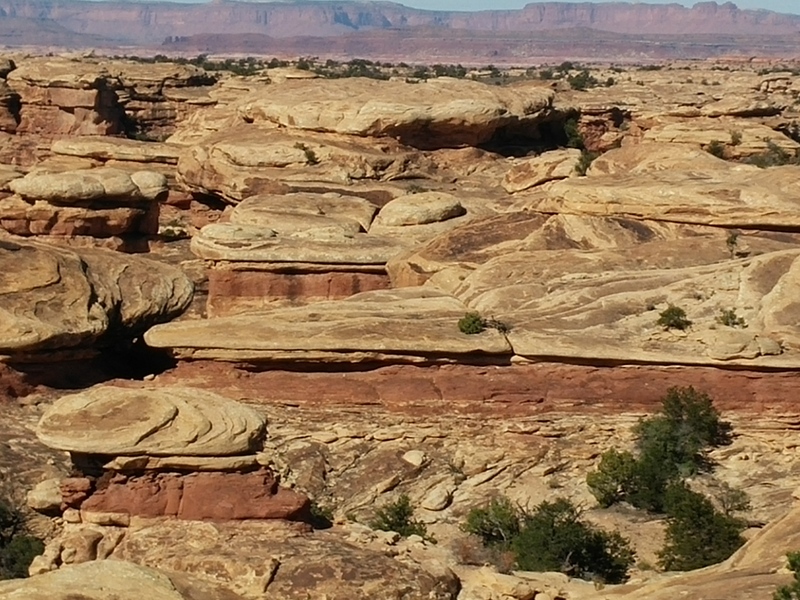 There are hundreds of petroglyphs in a small confined area. They are amazing! 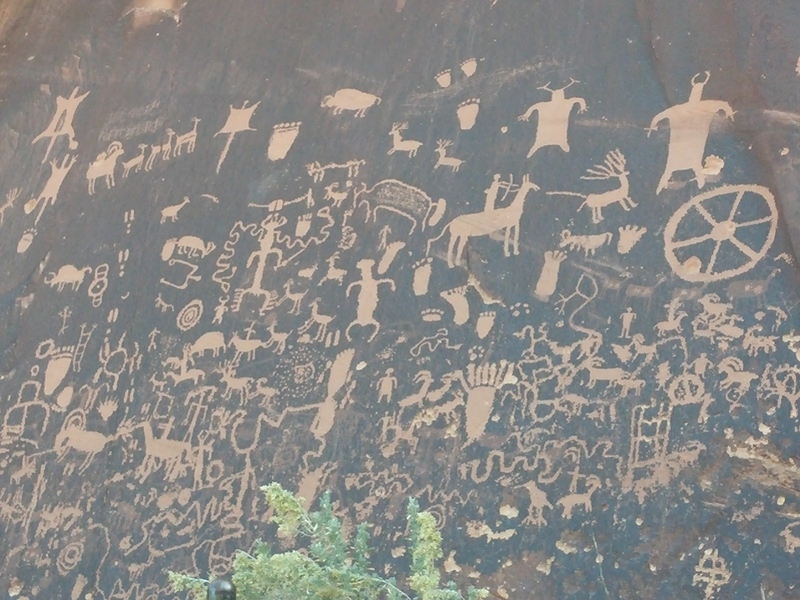 The petroglyphs were carved by Native Americans during both the prehistoric and historic periods. 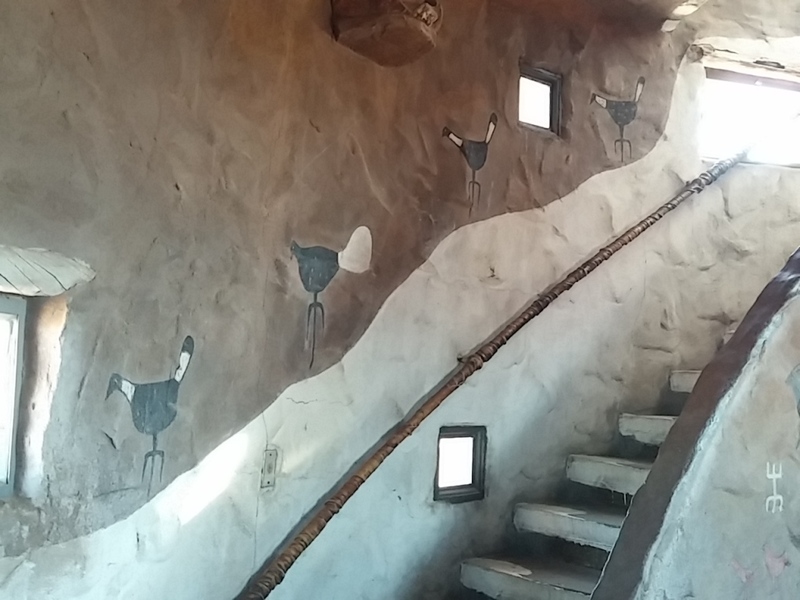 There are over 650 rock art designs. 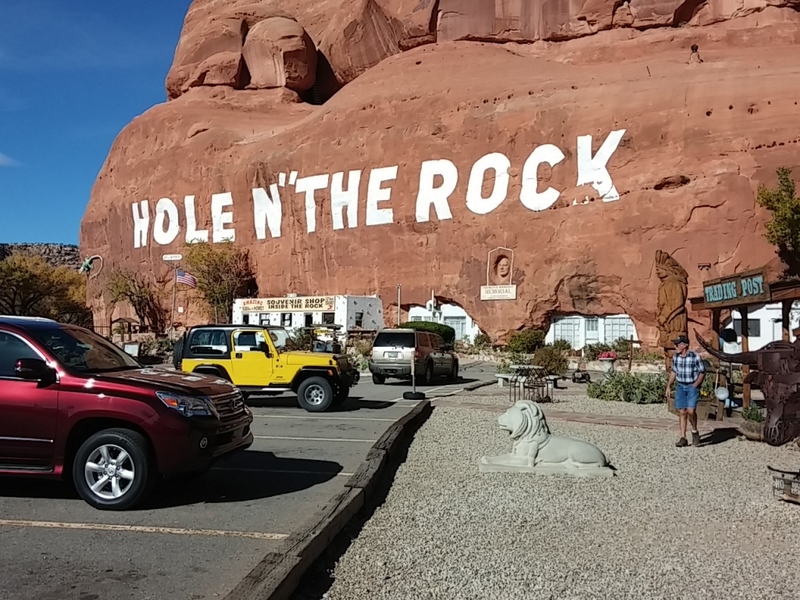 The drawings on the rock are of different animals, human figures, and symbols. 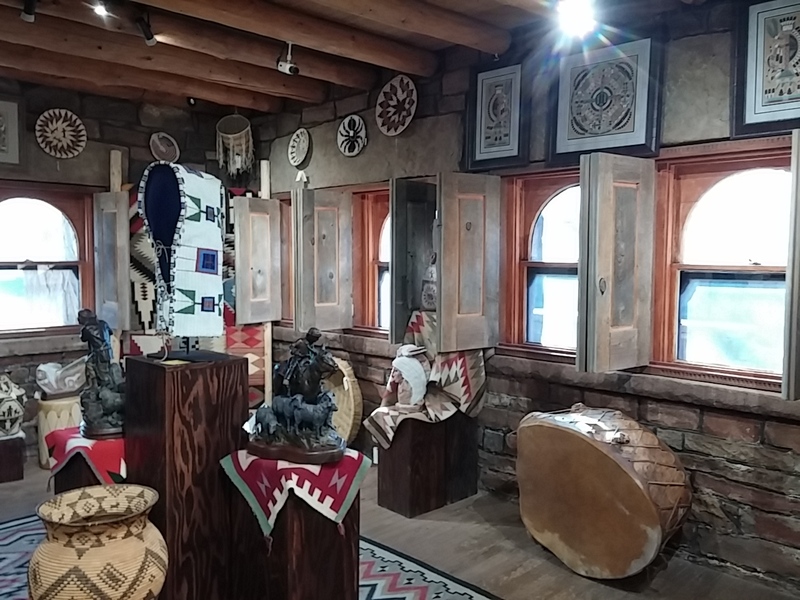 These carvings include pictures of deer, buffalo, and pronghorn antelope. 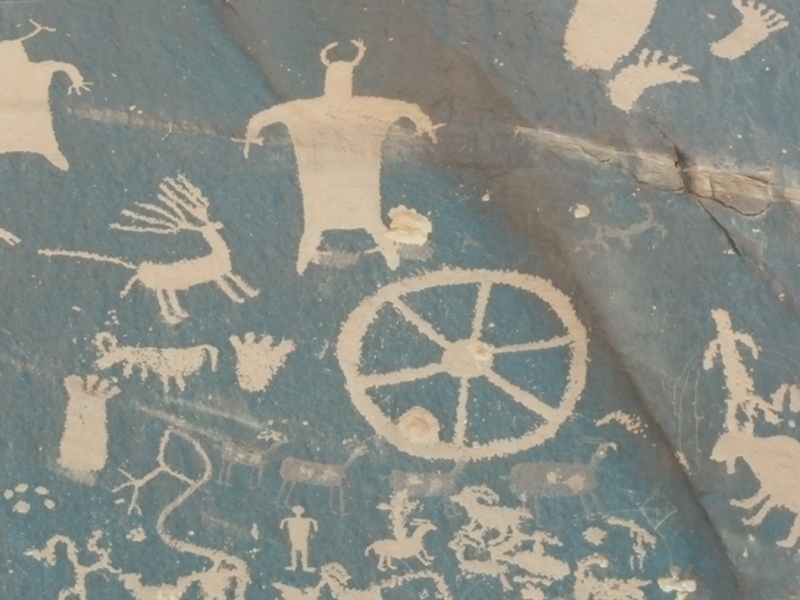 Some glyphs depict riders on horses, while other images depict past events like in a newspaper. While precisely dating the rock carvings has been difficult, repatination of surface minerals reveals their relative ages. 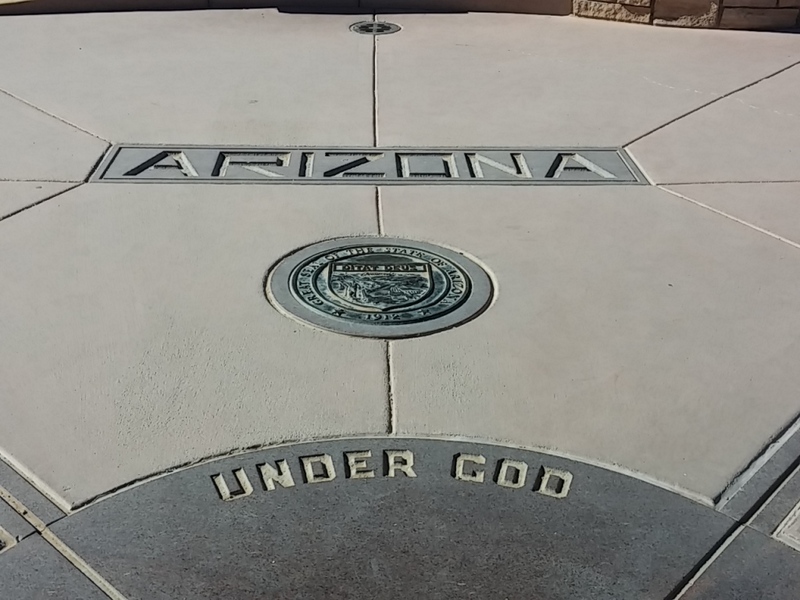 The reason for the large concentration of the petroglyphs is unclear. 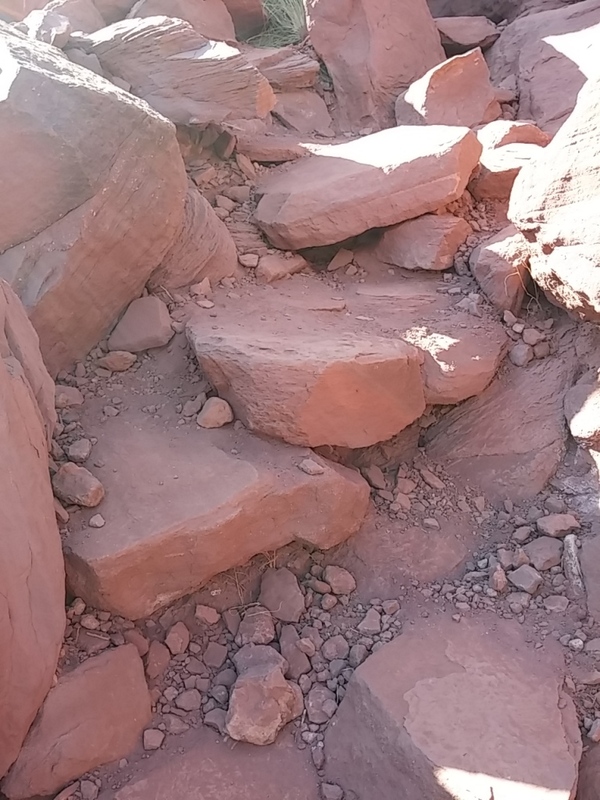 The pictures at Newspaper Rock were inscribed into the dark coating on the rock called desert varnish. 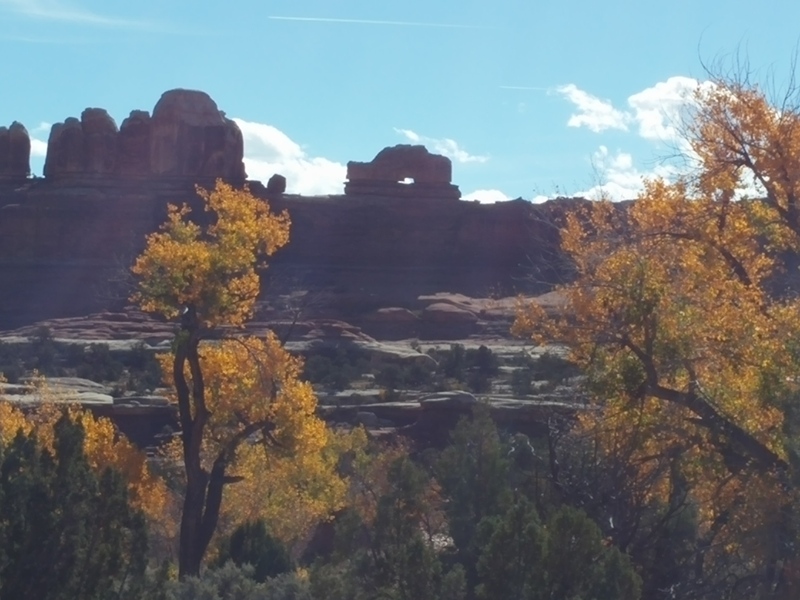 We then drove into The Needles area of the park. 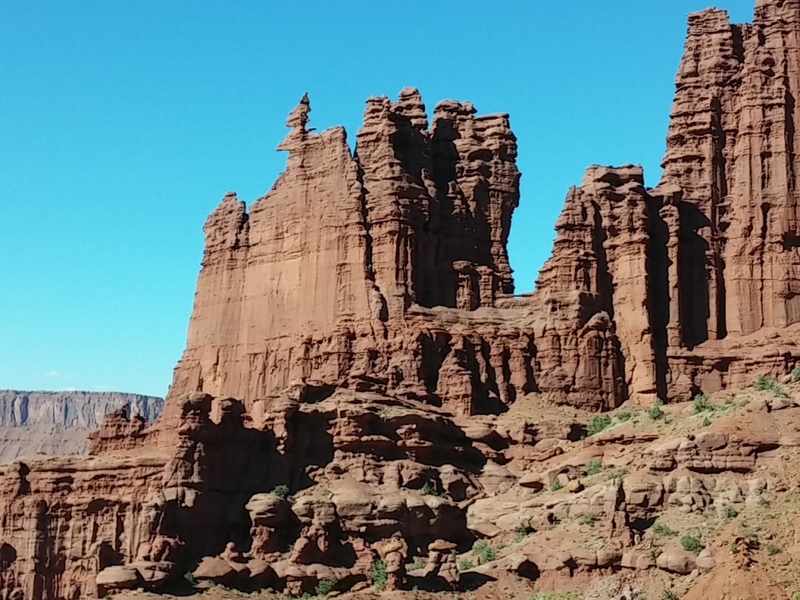 The Needles are named for the colorful spires that dominate the area. 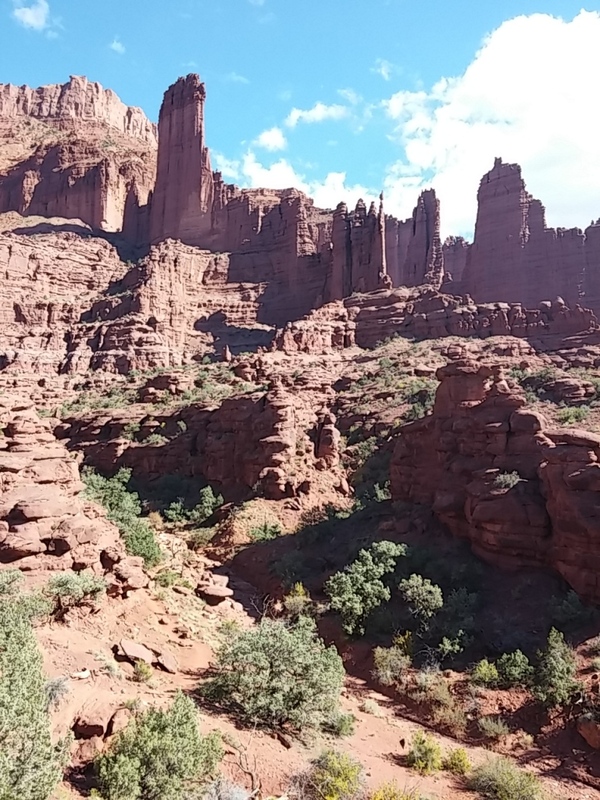 In Arches there are lots of senior citizens, and a lot of them are bicycling through the park. 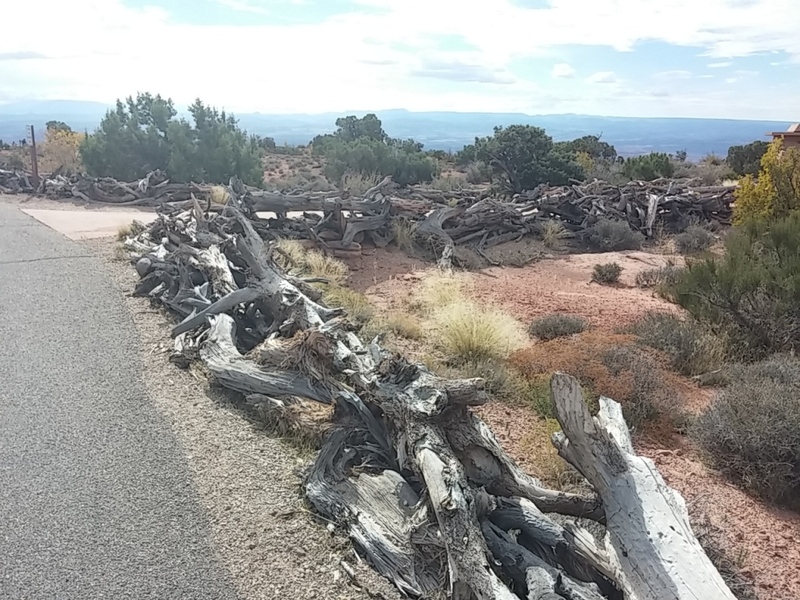 In the Island in the Sky area of Canyonland, there are senior citizens as well, but the ones riding their bikes are older by about 10-15 years than those in Arches. 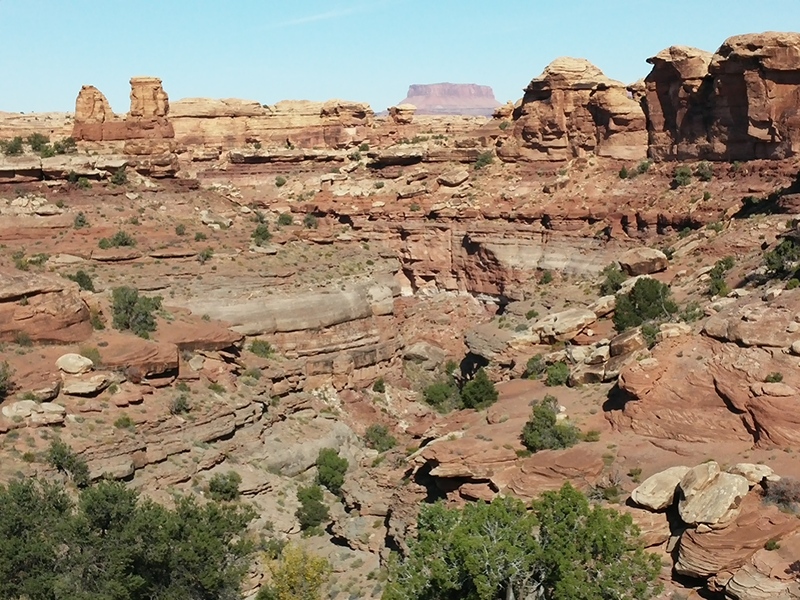 In The Needles portion of Canyonland, there are many more young 20 and 30-somethings. 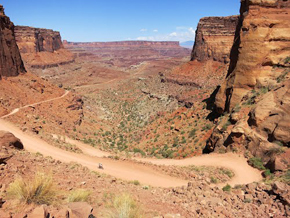 Most are hiking and/or riding bicycles with fat tires to the next trailhead. 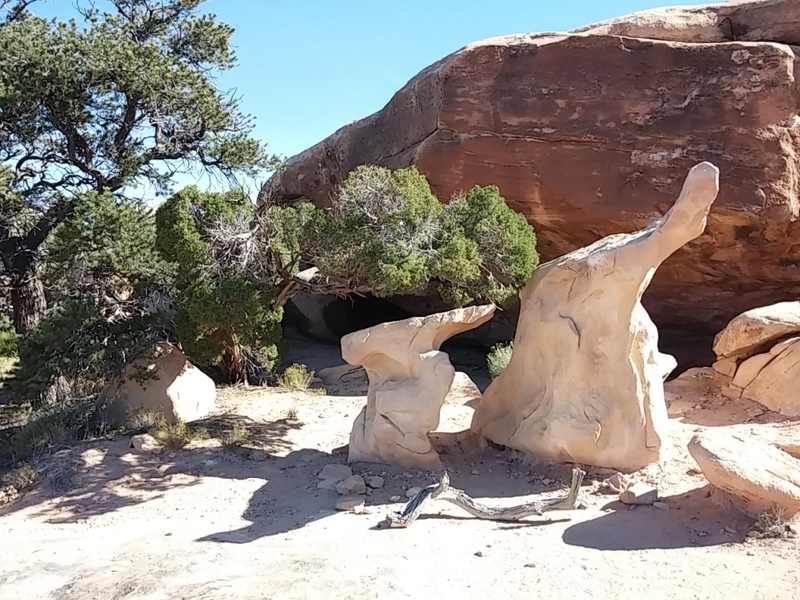 Odd rock formations that look like upside down elephant legs. 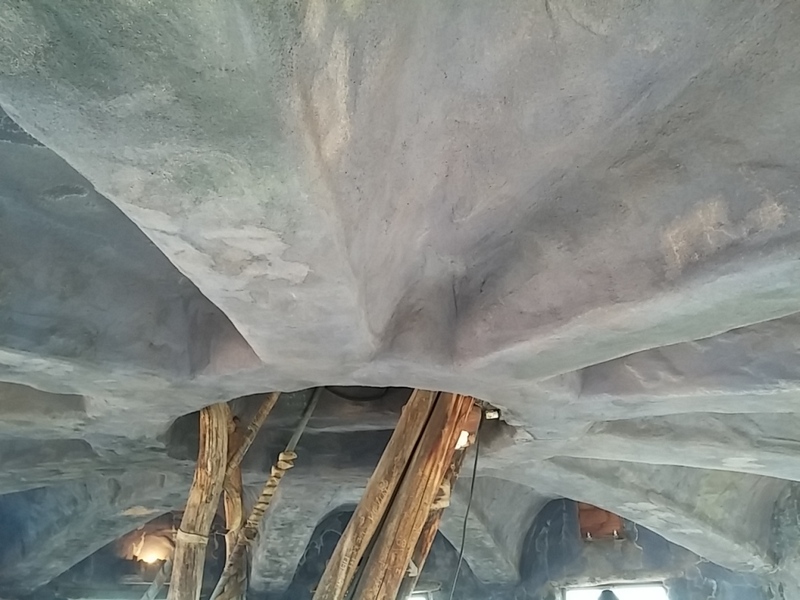 An arch that is shaped like and called The Wooden Shoe. These are called The Potholes. They look like they are boiling and have white tops like they are foaming. The colors and shapes variations are endless. 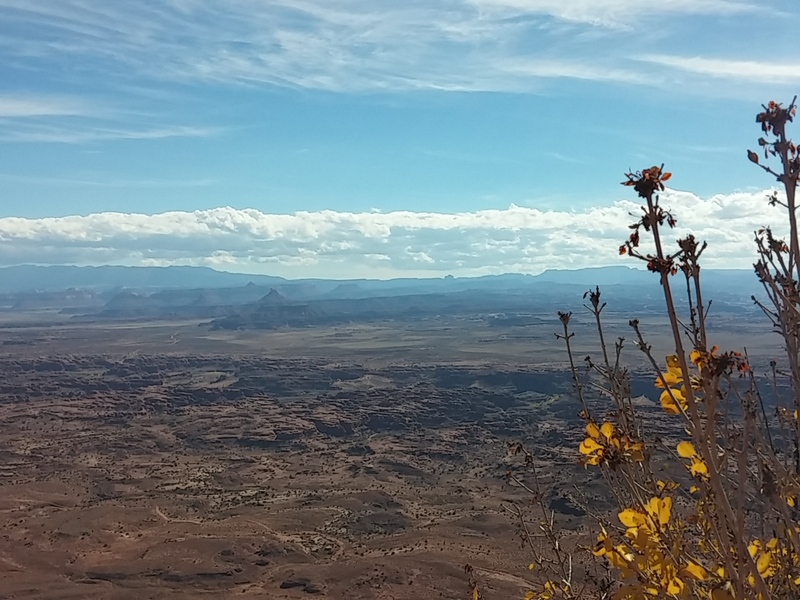 Here is looking north towards the Island in the Sky area with the Green and Colorado Rivers. And this is looking towards The Needles. 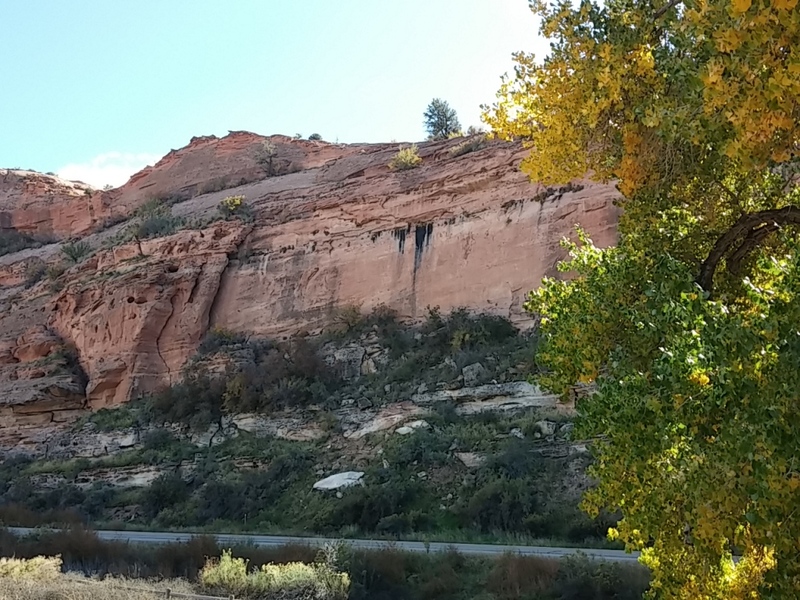 During the entire drive I was thrilled to see so many golden Cottonwood trees on our drive. Haven’t seen that many in one area since we left Fallon. 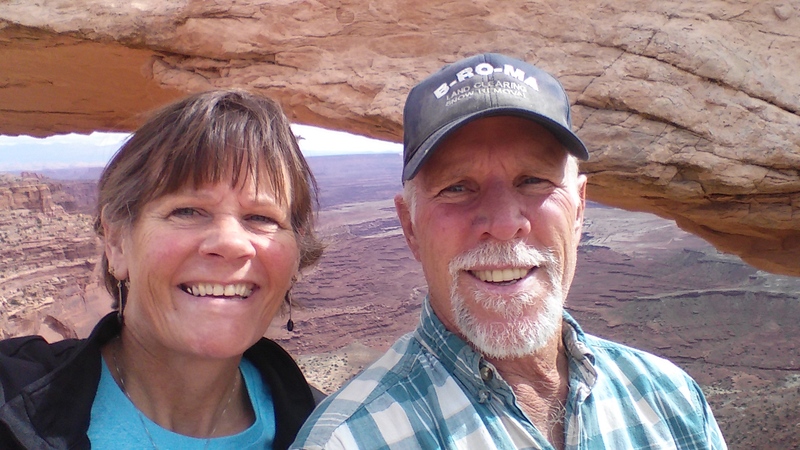 Rich and I realize how fortunate we are to be on this journey. And we also realize that we are very young to be in this position and very healthy to be able to do this. Every day is a gift. But once in a while, we get a gift that’s been wrapped in colorful paper and tied with a huge bow. 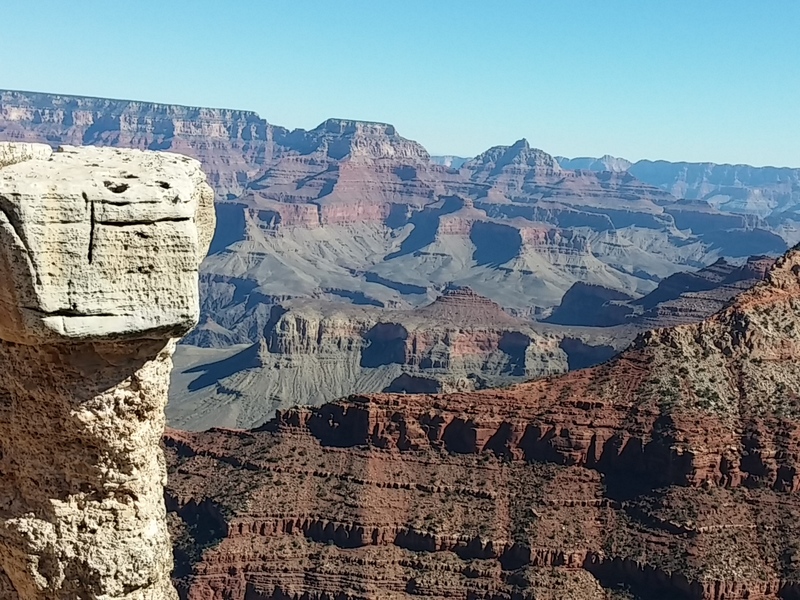 We had one of our most amazing afternoons on our trip a few days ago. 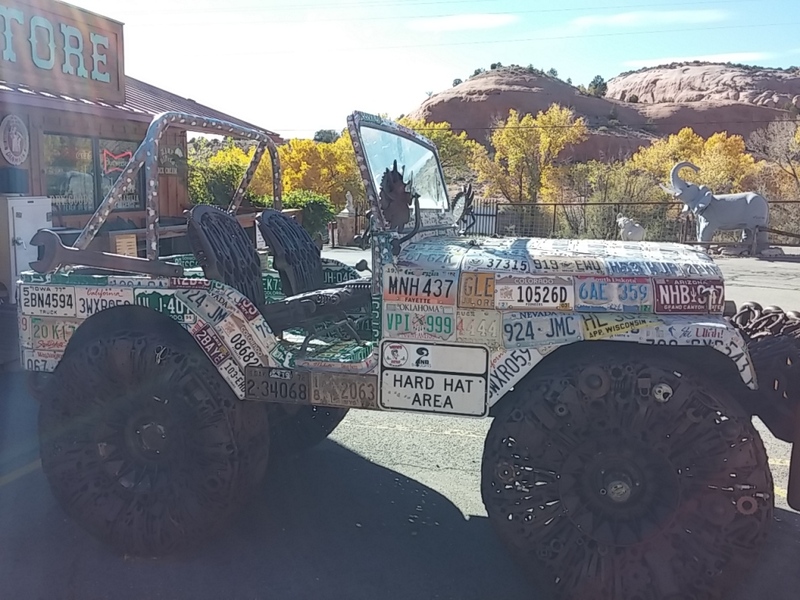 Part of the quintessential Moab experience is going on roads that only Jeeps, ATVs, OHVs, and other vehicles that crazy people drive can travel on. 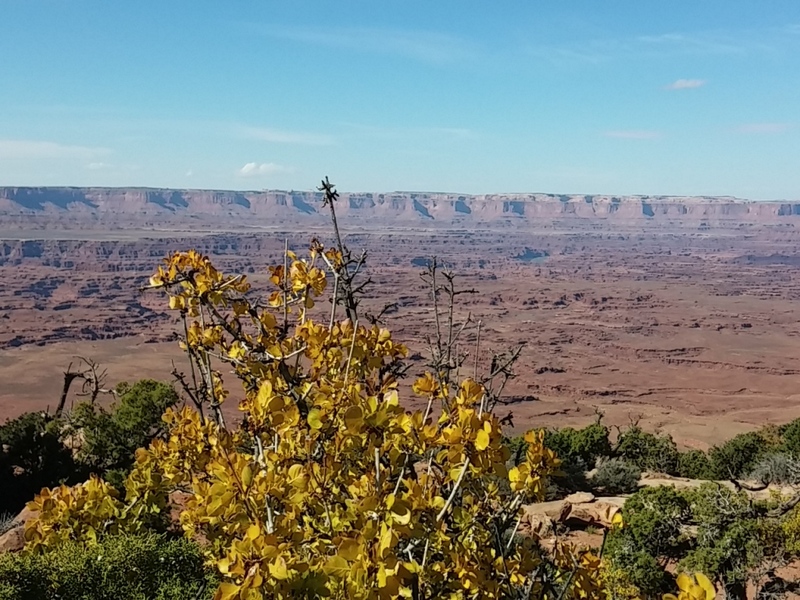 We spent the morning driving around the highly touristed areas of Canyonlands. As near as I can determine we dropped from 6200′ to 4000′ in about 1.5 miles. 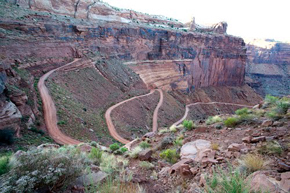 I lost count of switchbacks at six. 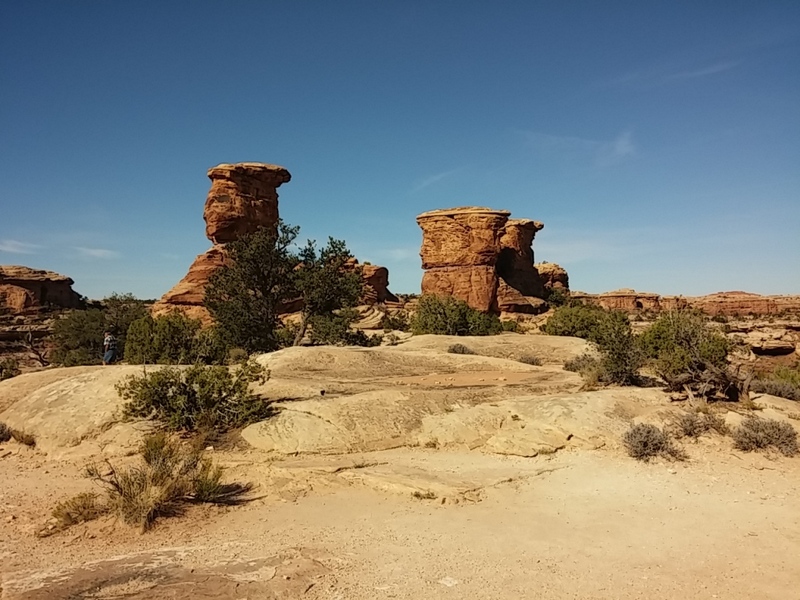 The trail was originally built by ranchers John & Frank Shafer in the early 1910’s to transport their cattle from the mesa to the canyon. In the 1950’s it was widened to allow uranium miners to transport ore. 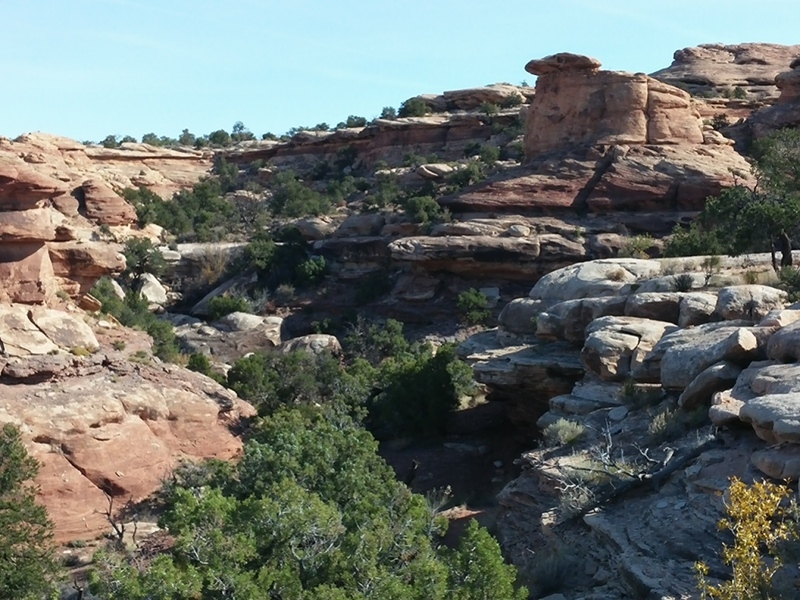 Many movies and commercials are filmed in Shafer Canyon. 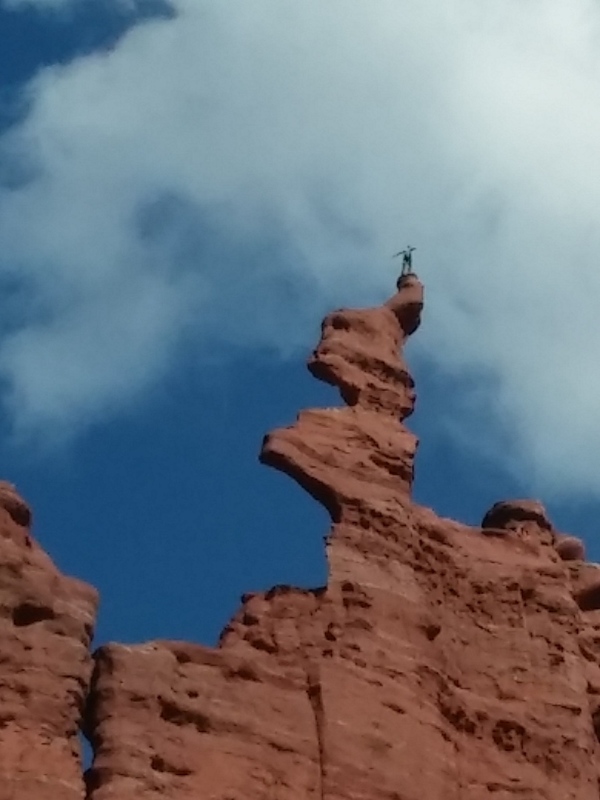 Thelma and Louise took their final leap into the canyon. Here are some text and pictures from DangerousRoads.org. 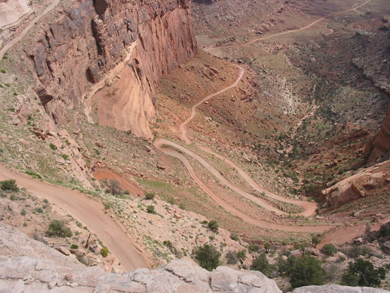 The road is winding, in some places only wide enough for one vehicle, and in many places bordered on one side by cliffs and on the other side by a drop of hundreds of meters (many hundreds of feet) unprotected by guardrails. Words can’t describe the road and pictures don’t do it justice. The Shafer Trail provides access to the White Rim Trail as well as other areas in the park and is perhaps one of the most challenging journeys through the park. 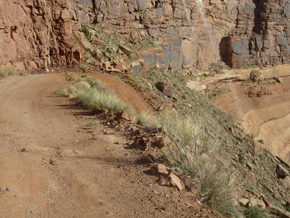 It requires extreme caution at the best of times for vehicles and mountain bikes, but especially so in inclement weather and at night. 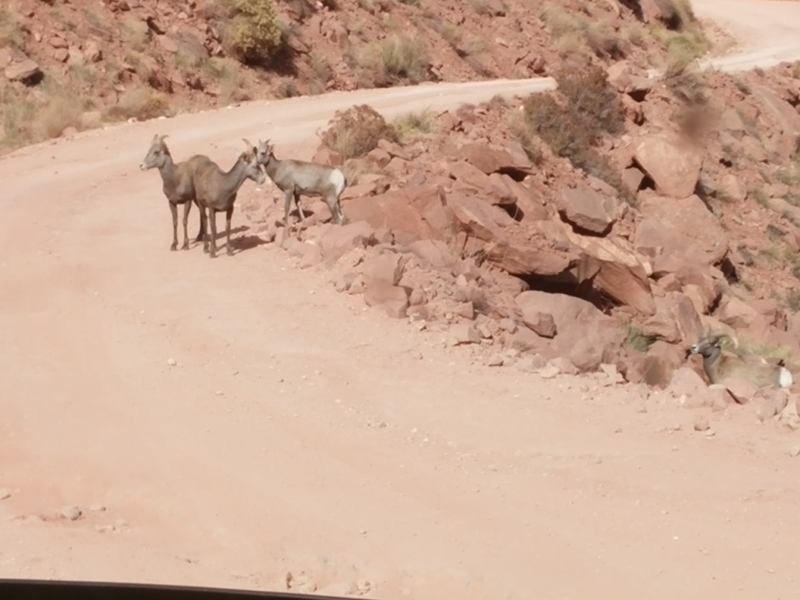 Desert Bighorn Sheep, also known as Nelson’s, are smaller than their cousins, Rocky Mountains. 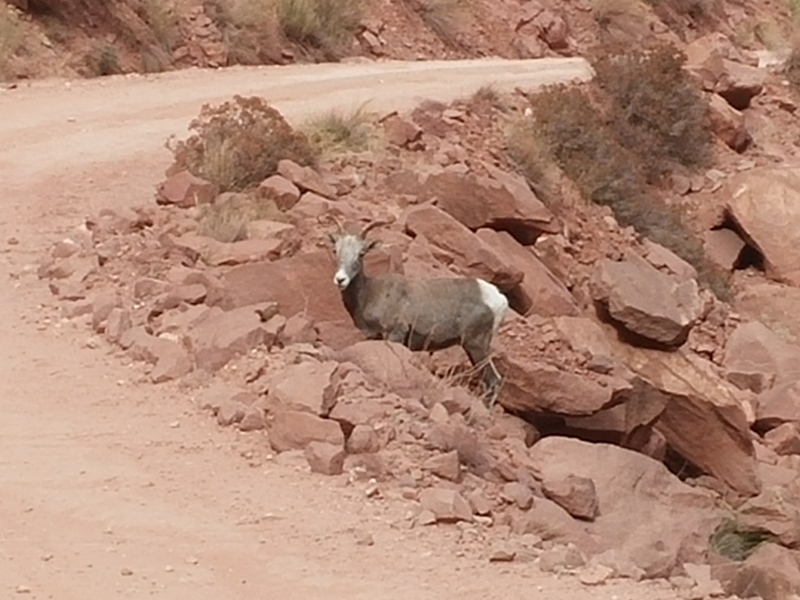 There are only 350 of them in the park’s 525 square miles, so we felt very special to see 1% of them on our drive. 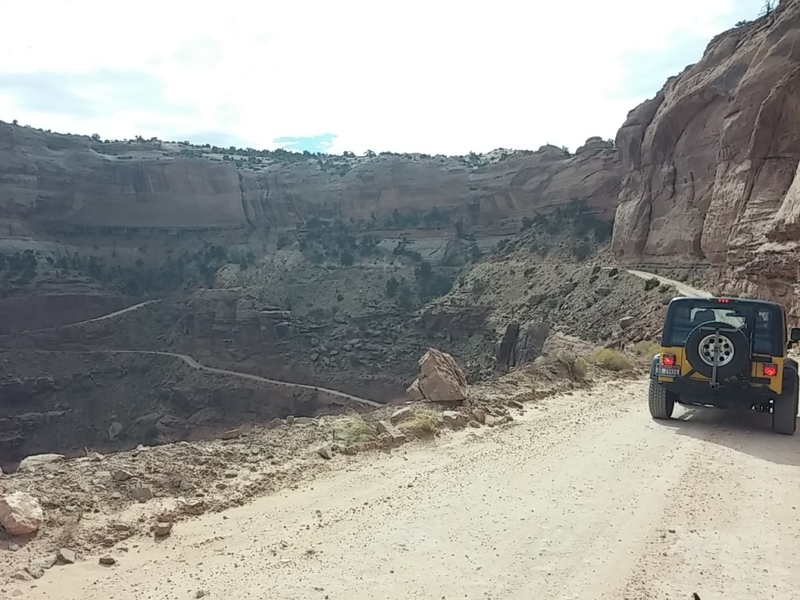 Here is a photo of our Jeep on the road to prove to me that we did it… I’m not particularly fond of roads with no guard rails and very steep terrain. 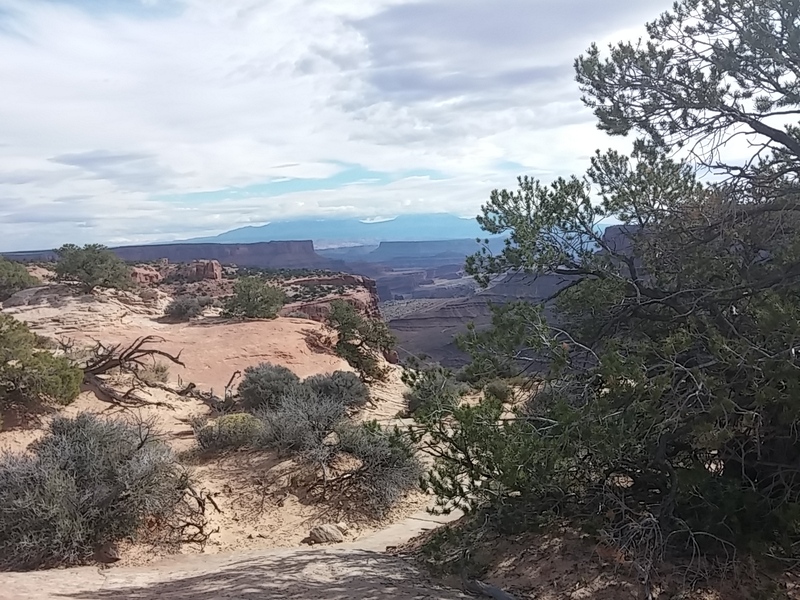 We visited Canyonlands National Park the other day. 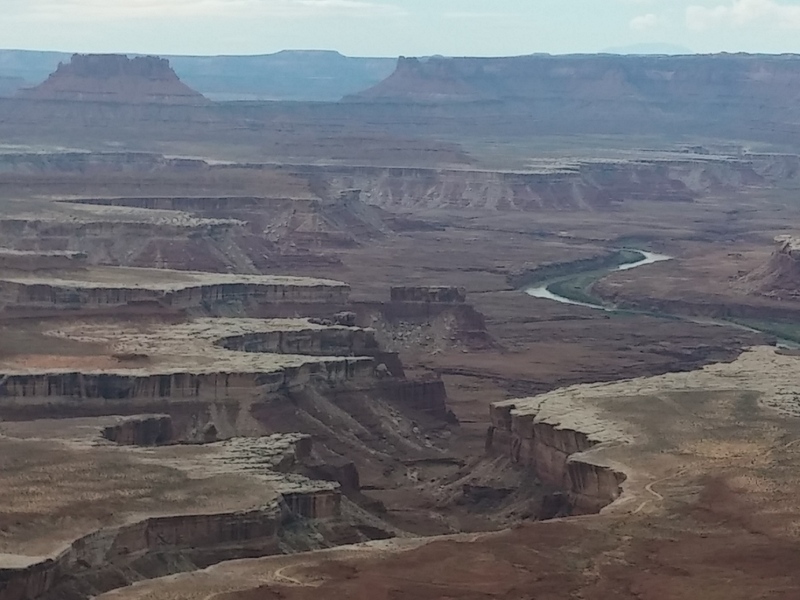 It’s a beautiful park of over 500 square miles carved by the Colorado and Green Rivers into canyons after canyons after canyons. 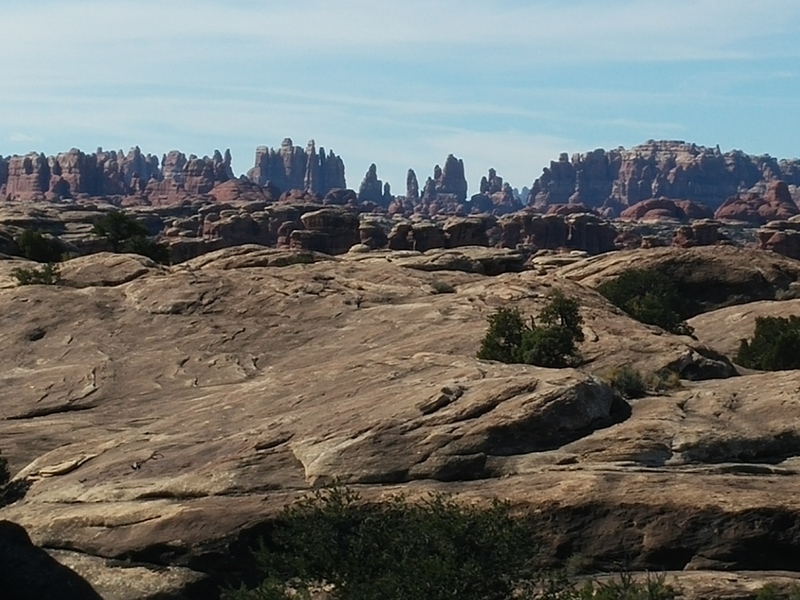 There are three distinct parts of the park: Island in the Sky, The Needles, and The Maze. We visited Island in the Sky on this visit. 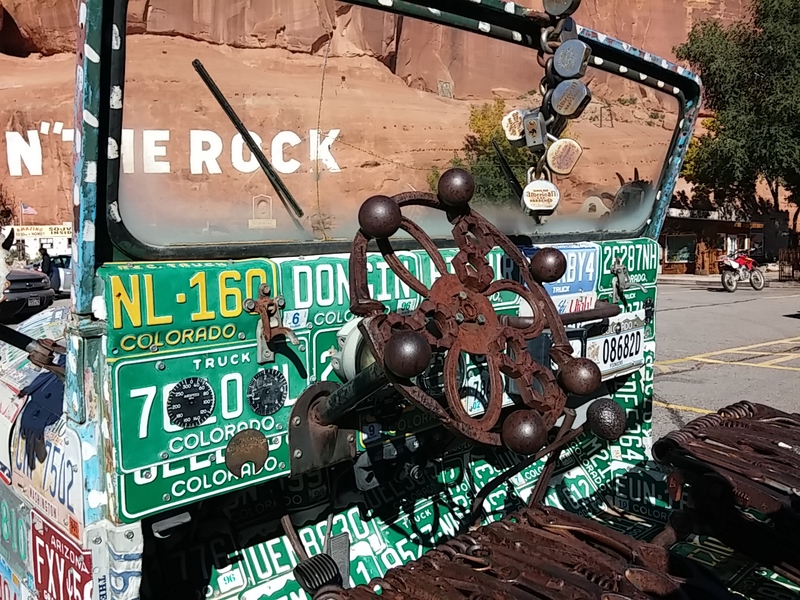 We will visit The Needles on another day. But we won’t be visiting The Maze because it is very remote. Rangers gave informative presentations so that we could learn more about geology. You can view the magnificent vistas in the background. People were pursuing their photography passions. 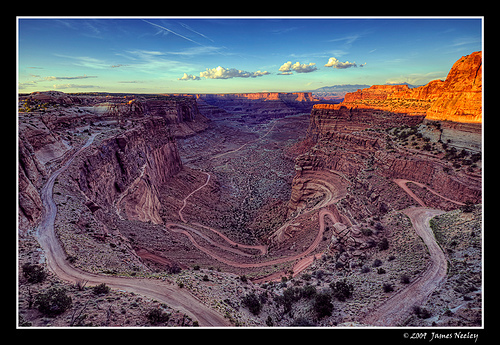 The view of the Green River and the path it cut through the landscape was impressive. 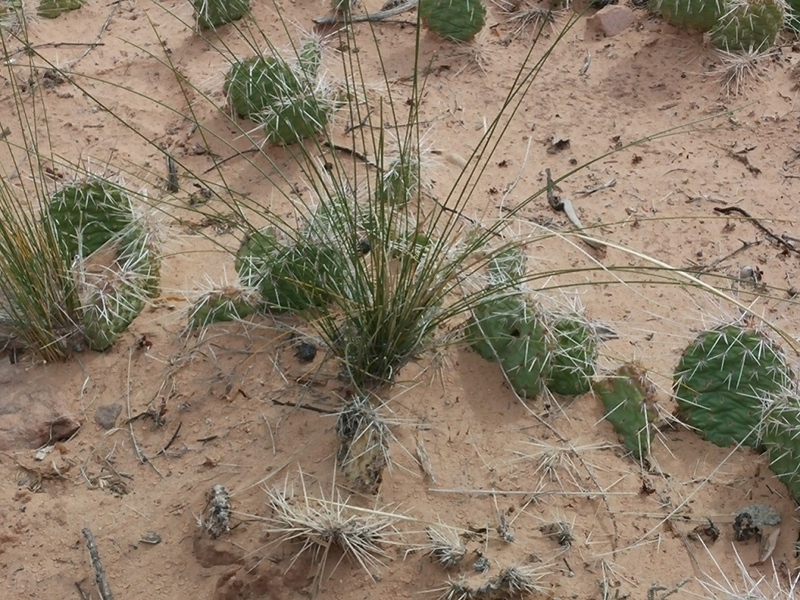 …which are recycled into fencing after they fall down. 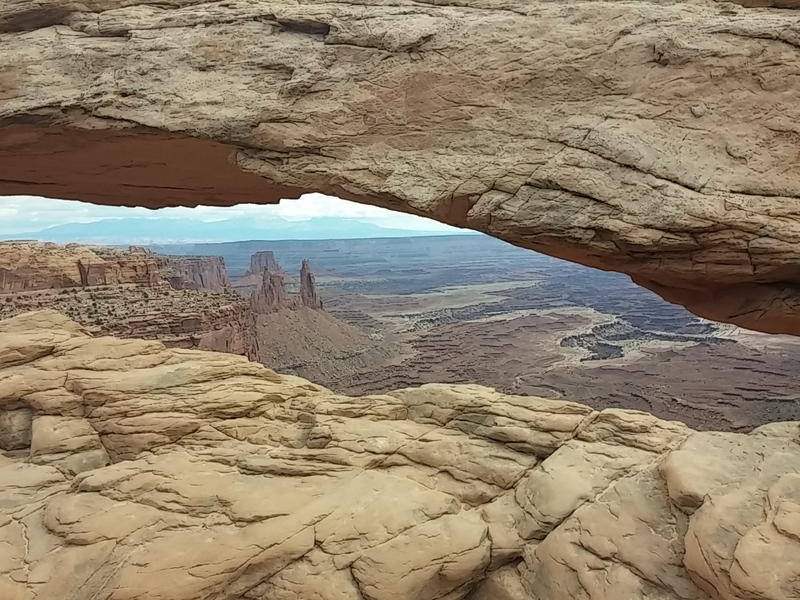 Unbelievable view through an arch. 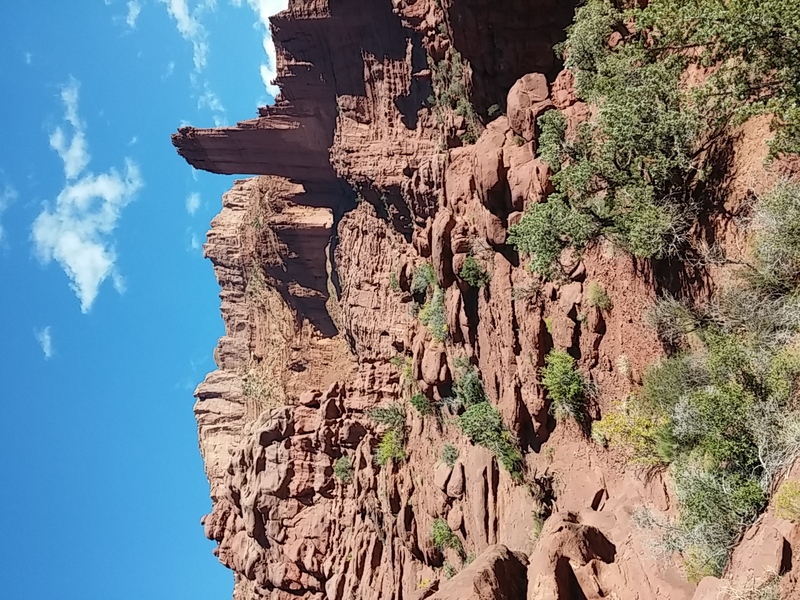 While Arches National Park is stunning, I actually enjoyed our drive along the Colorado River east of Moab and a short hike around the bottom of Fisher Towers more. 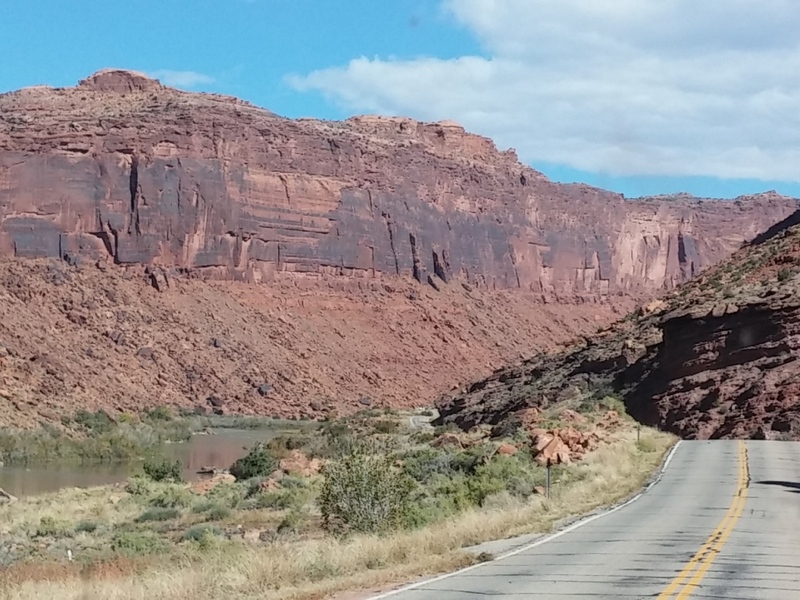 Highway 128 starts just north of Moab and follows the river for almost thirty miles. 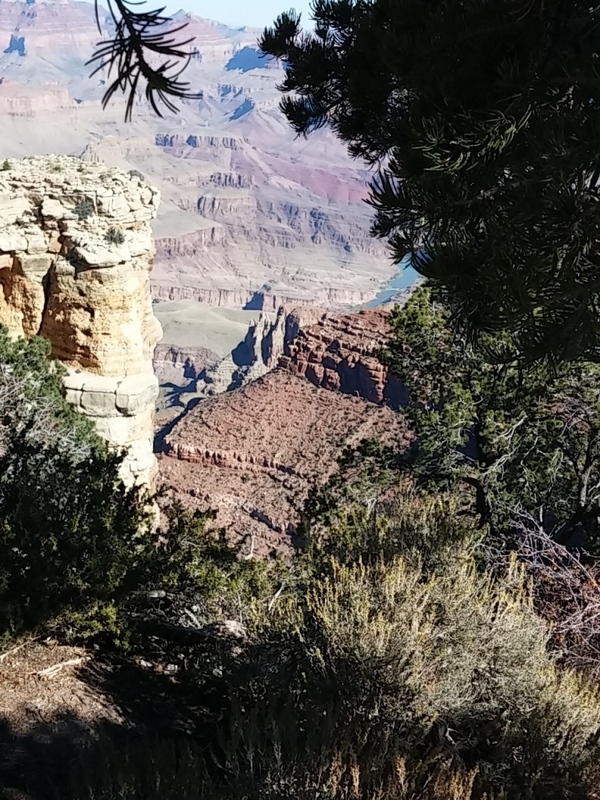 The red rock that lines the canyon is covered with desert varnish–black, brown, or orange streaks. Also known as rock varnish, it is an accumulation of iron and/or manganese oxides. 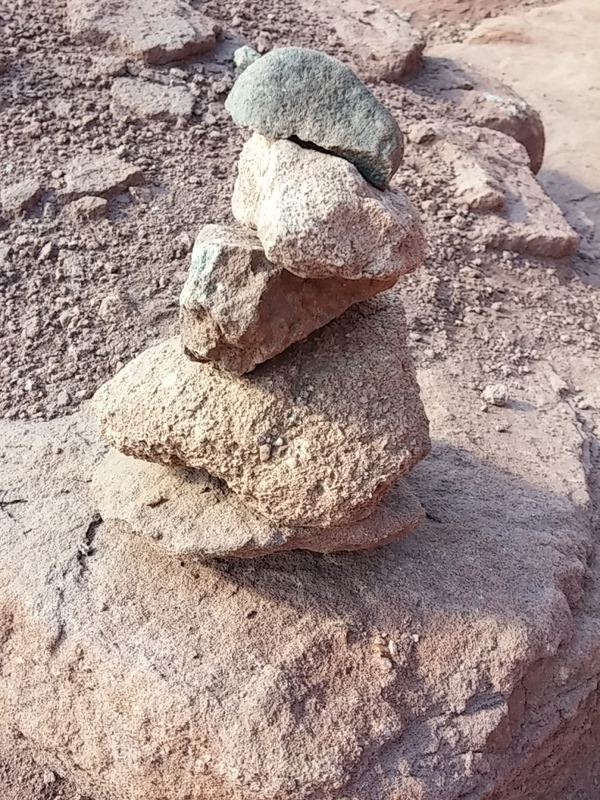 The varnish does not come from within the rock but is obtained from the environment, most likely from rainwater. The darker the varnish, the older the varnish. These varnishings must be really, really old. 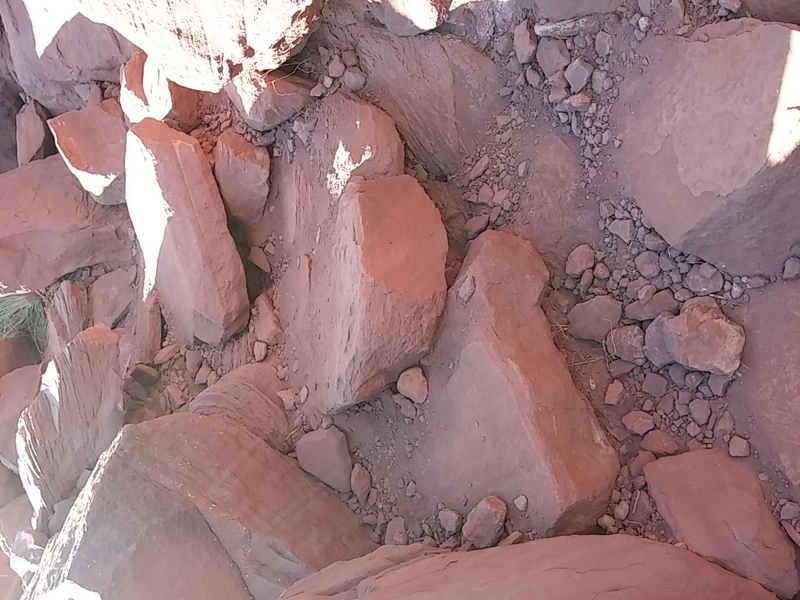 Most of the hike is on solid rock, but surprisingly the rock wasn’t slick. 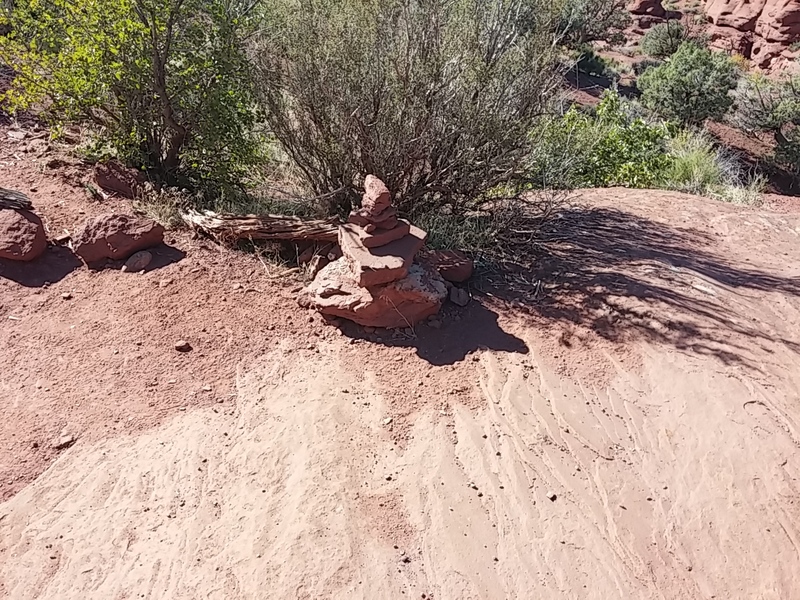 There were lots of cairns marking the trail. We were thankful for them because sometimes the trail was hard to find. See the tallest tower on the left side of this picture? 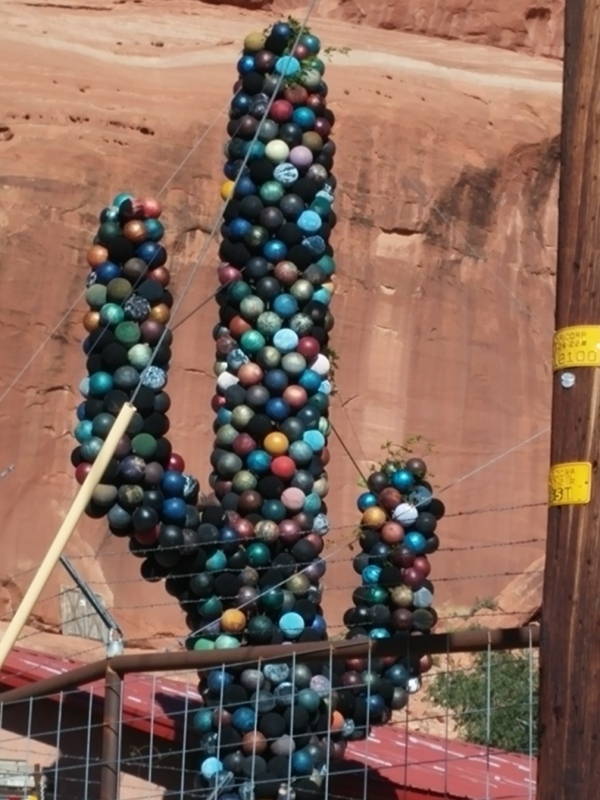 Three people were climbing it! 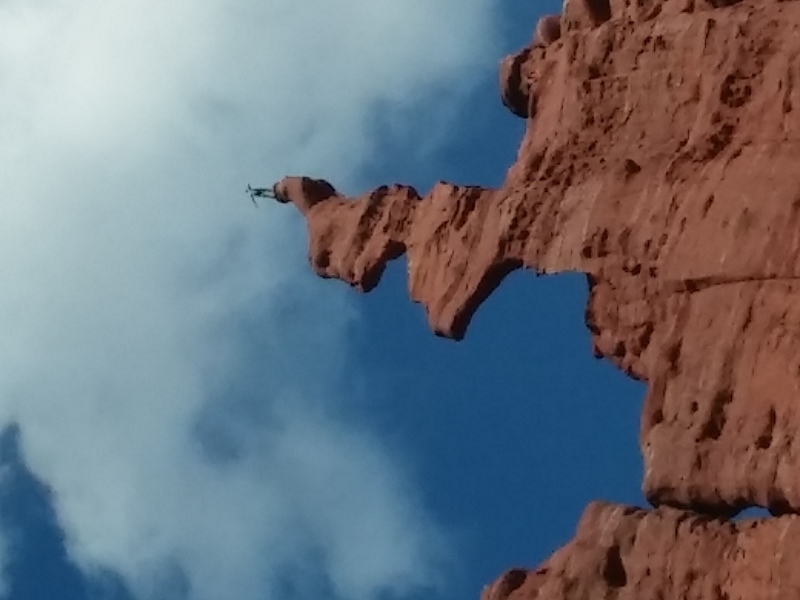 You can see one of them standing on the top rock in this picture. 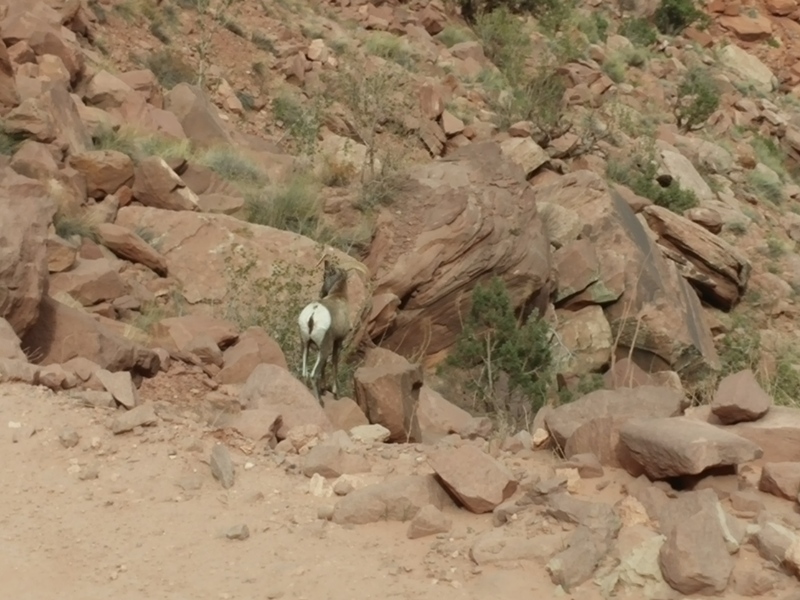 Unfortunately I just missed him or her doing a yoga pose! Standing on one foot, arms spread wide open, gaze turned to the sky. Amazing! After we picked our jaws up off the ground, we continued on our hike. Some of the steps were made of stones. 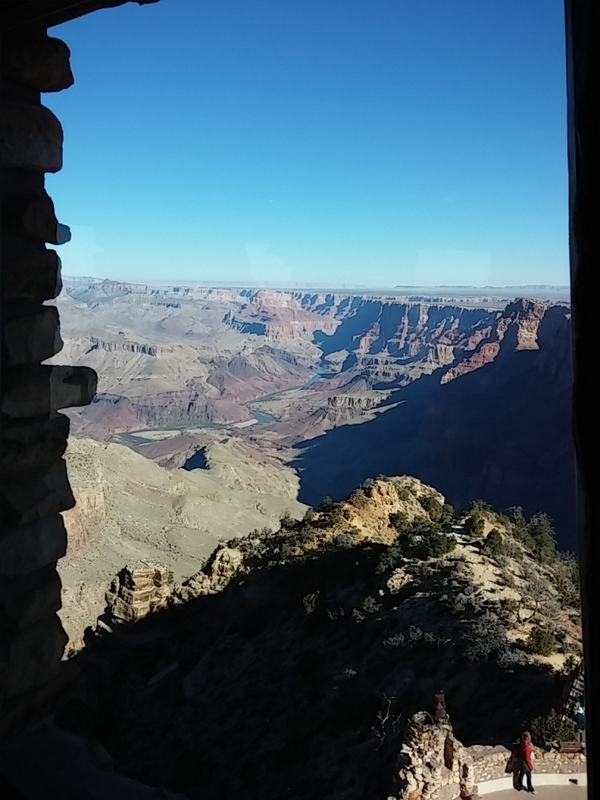 The views were amazing. We were surprised at how green the vegetation was. 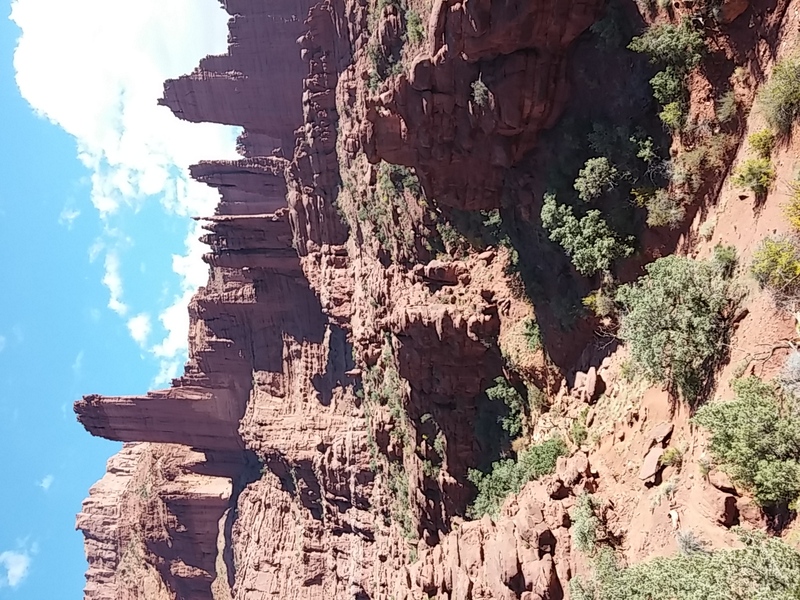 There were lots of towers. 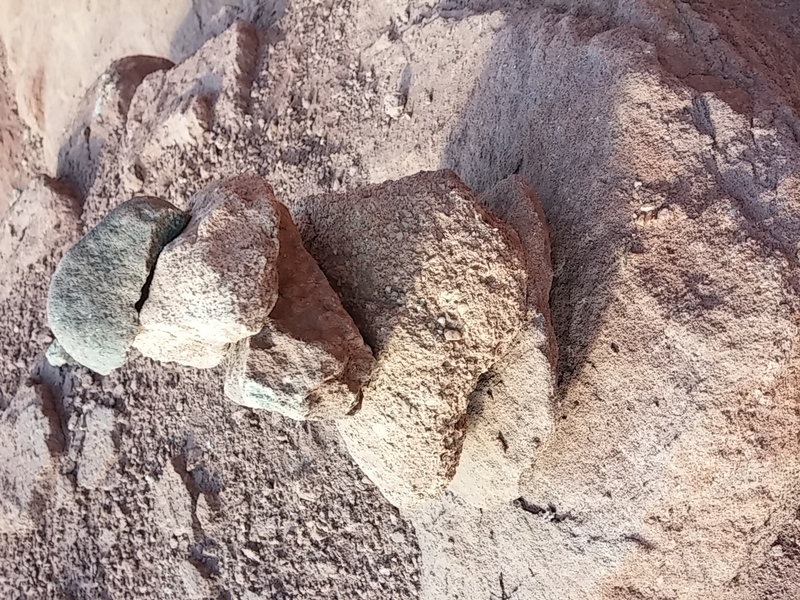 If you ever go there, look for this cairn. I made it!